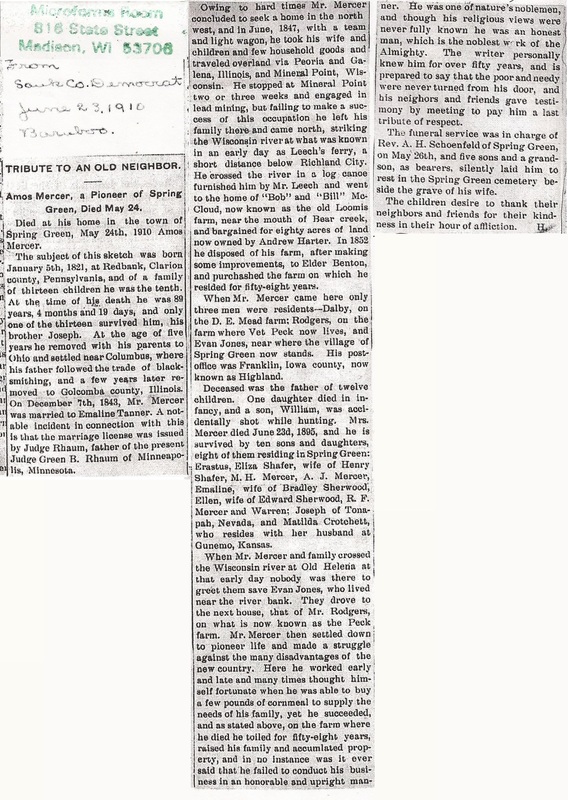 Nickname Amos Erastus Mercer also went by the name of Raz. Raz Mercer was a homesteader. "The next settler in the town of Buena Vista was Amos Mercer, who also came in the spring of 1847. He was from southern Illinois. He settled on the west half of the souteast quarter of section 28, town 9, range 2 east, on the farm now owned by A. Harter. Mr. Mercer is a properous farmer of Sauk County. "13 In 1847 The next settler in town of Buena Vista was Amos Mercer, who also came in the spring of 1847, from southern Illinois. He settled on the west half of the southeast quarter of section 28, town 9, range 2 east, but afterward removed to Sauk county, where he became a prosperous farmer. 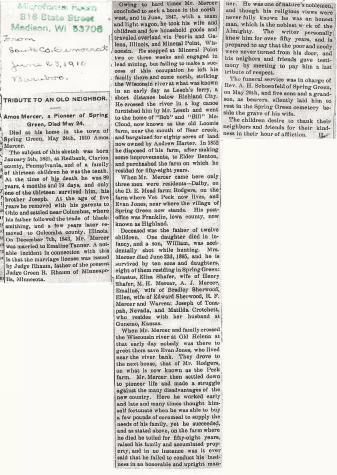 Amos Erastus Mercer migrated on 1 June 1847 at Golconda, Illinois to ; "On the first day of June, 1847, Amos and Emeline Mercer, with their two small children, began their overland journey to Wisconsin, by wagon and team. The route led through Springfield, Bloomington, Peoria, Galena, Mineral Point and Helena, to Spring Green, Wisconsin, arriving at their destination on July 9, a little over a month from the date they began. They moved into their homestead four years later. The widow of their son, Amos, Jr., now lives there. At that time there were only three families in Spring Green. The nearest post-office was Highand, 40 miles away, from which they received mail twice a year. She is buried in Spring Green cemetery. 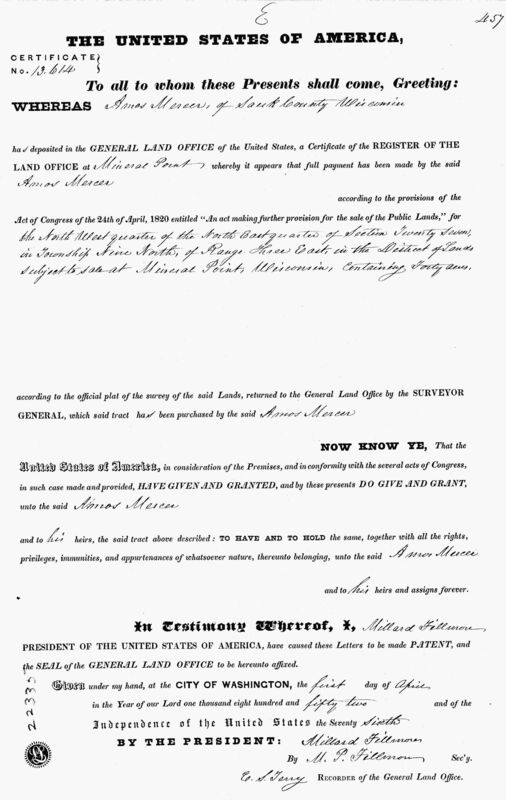 "1 He purchased land on 1 April 1852 at Sauk, Wisconsin, NW quarter of the NE quarter of Section 27 in Township 9N of Range 3E in the district of lands subject to sale at Mineral Point, Wisconsin, containing 40 acres. 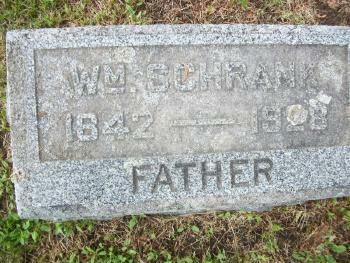 He was a farmer in 1860 at Spring Green, Sauk, Wisconsin. 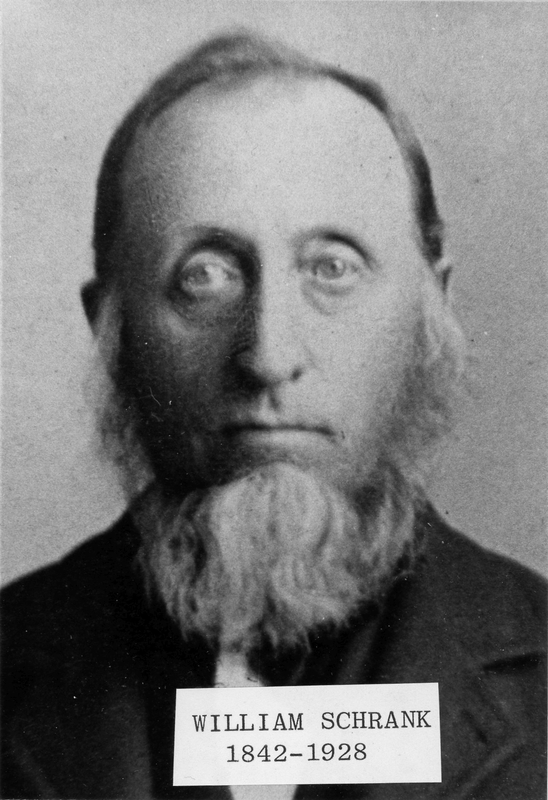 With his brother Joseph Custard Mercer Jr, on 30 June 1863 at Civil War Draft Registration, Spring Green, Sauk, Wisconsin. In 1868 at Spring Green, Sauk, Wisconsin, purchased a Case Co. Ground Hog thresher. It was driven by two-horse tread power and had an output of two to six bushels per hour. It threshed for the Mercer family for 50 years. Amos Erastus Mercer was a farmer in 1870. He was a farmer in 1880. He was a farmer in 1900. He was a farmer in 1910. 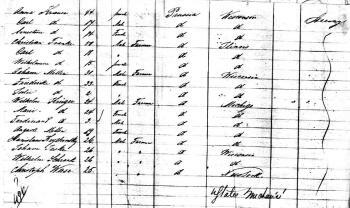 [S4] Illinois, Illinois Marriages to 1850, Mercer, Amos married Tanner, Emilene on 07 Dec 1843 in Pope County, Illinois. [S221] Richland Wisconsin History, online, Chapter 21 - Town of Buena Vista. Name Variation Emeline Tanner was also known as Emilina. 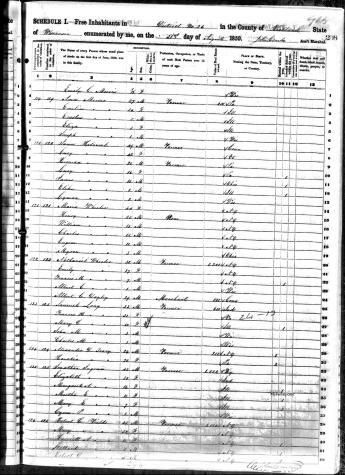 1830 Pope, Illinois Emeline Tanner was referenced on Thomas Wootten Tanner Sr's household in the 1830 Census at Pope, Illinois; page 34. Thomas is between 20 and 30 years old. Living with him are 1 female 20-30 (wife Betsy), 1 5-10 (Elizabeth) and 1 less than 5 years old (Emeline). Males living with him are 2 less than 5 years old (Levi and Thomas Jr). 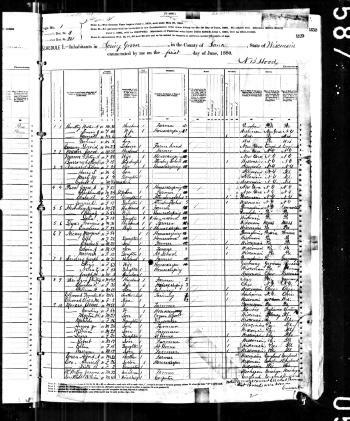 1840 Pope, Illinois Emeline Tanner was referenced on Thomas Wootten Tanner Sr's household in the 1840 Census at Pope, Illinois; page 185. Living next door to John Crotchett. Thomas is between 30 and 40 years old. Living with him are 1 female 30-40 (wife Betsy), 1 15-20 (Elizabeth), 1 10-15 (Emeline) and 1 less than 5 years old (Martha). Males living with him are 1 10-15 (probably Levi), 1 5-10 (Thomas Jr.) and 1 less than 5 years old (Charles). 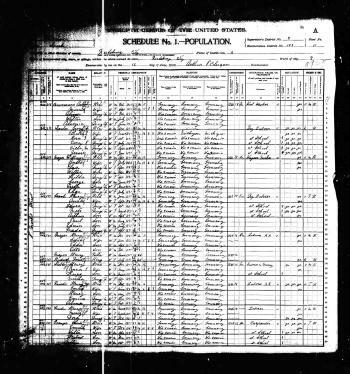 Emeline Tanner migrated on 1 June 1847 at Golconda, Illinois to ; "On the first day of June, 1847, Amos and Emeline Mercer, with their two small children, began their overland journey to Wisconsin, by wagon and team. The route led through Springfield, Bloomington, Peoria, Galena, Mineral Point and Helena, to Spring Green, Wisconsin, arriving at their destination on July 9, a little over a month from the date they began. They moved into their homestead four years later. The widow of their son, Amos, Jr., now lives there. At that time there were only three families in Spring Green. The nearest post-office was Highand, 40 miles away, from which they received mail twice a year. She is buried in Spring Green cemetery. 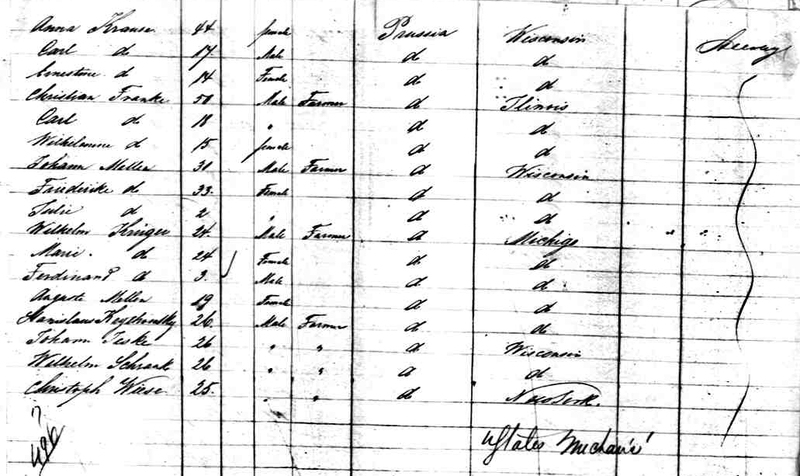 "1 In Elizabeth Christian Bain's will dated 30 October 1879 at Pope, Illinois, Emeline Tanner was named as an heir; Will of Elizabeth Christian Bain Tanner Glass - probate 04 Mar 1880. Name Variation Louise Carolina Adolphina Marie Arndt was also known as Louisa K.
Name Variation Louise Carolina Adolphina Marie Arndt was also known as Decker mother's maiden name. Name Variation Louise Carolina Adolphina Marie Arndt was also known as Luise Caroline Adolfine. Name Variation Louise Carolina Adolphina Marie Arndt was also known as Ahrendt. 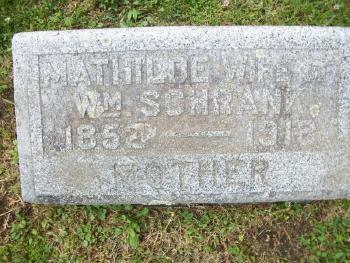 Name Variation Louise Carolina Adolphina Marie Arndt was also known as Schreiber maiden name listed in cemetery record. Name Variation Louise Carolina Adolphina Marie Arndt was also known as Louise. Name Variation Louise Carolina Adolphina Marie Arndt was also known as Dekker mother's maiden name. Married Name circa 1876 As of circa 1876,her married name was Prieskorn. She was the daughter of Friedrich Heinrich Daniel Arndt and Anna Maria Elisabeth Decker. She married Charles Prieskorn, son of Johann Prieskorn and Louise Prohl, circa 1876 at Burlington, Des Moines, Iowa. 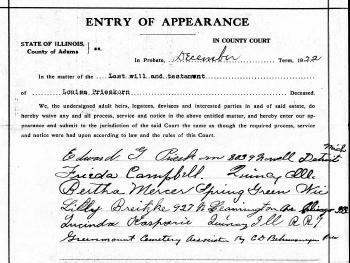 Louise Carolina Adolphina Marie Arndt witnessed the probate of the estate of Charles Prieskorn on 4 March 1910 at Adams, Illinois; Probate record for Charles Prieskorn. 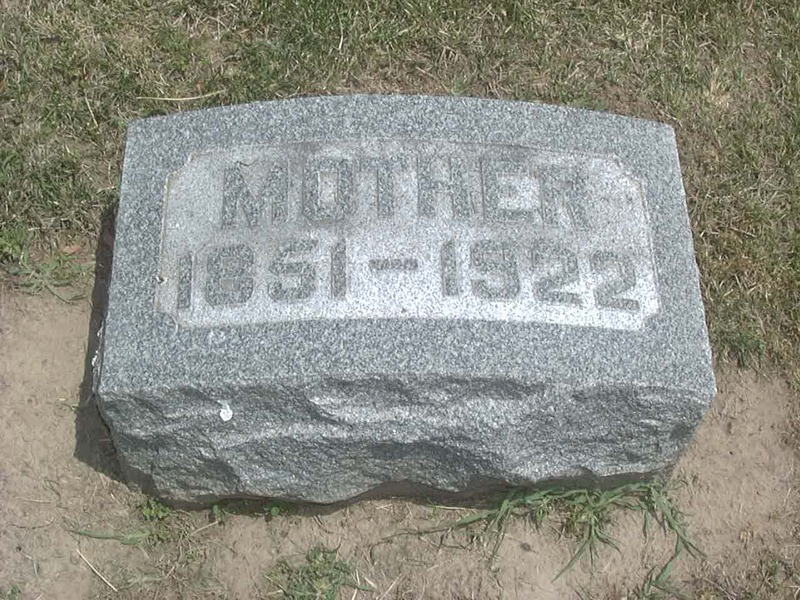 She was buried on 7 December 1922 at Greenmount Cemetery, Quincy, Adams, Illinois, Stone marked "Mother"; in burial records, maiden name listed as SCHREIBER; Block 4, Lot 045, Section SW, Grave S; also reported as 05 Dec 1922. Volume: 373-7 I, VIII A 1 Band 032 B. 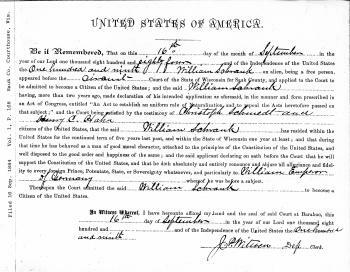 She immigrated on 27 July 1875 to ship Pommerania, New York, with 2-year-old daughter Lucinde. She migrated circa 1876 at Burlington, Des Moines, Iowa. 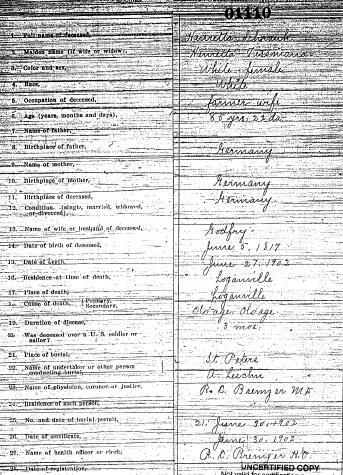 She had listed 6 with 2 (not) living in 1900 children. 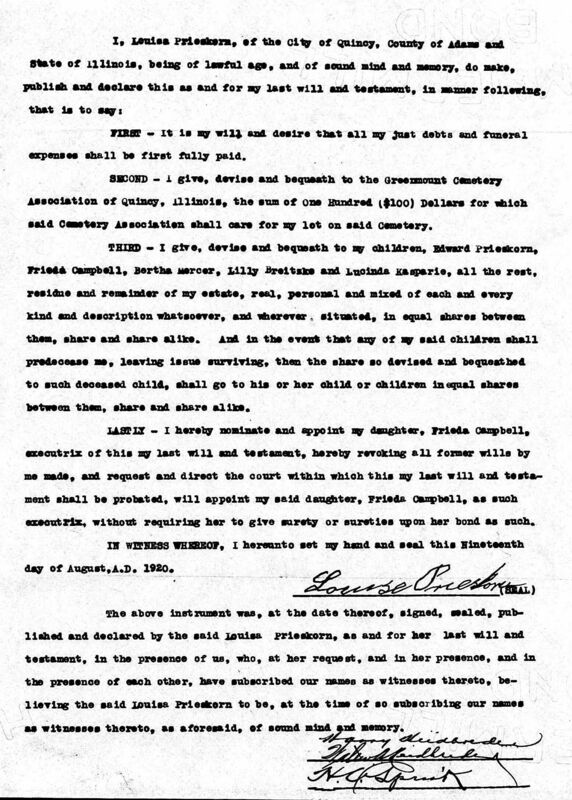 In Charles Prieskorn's will dated 21 April 1908 at Adams, Illinois, Louise Carolina Adolphina Marie Arndt was named as an heir. 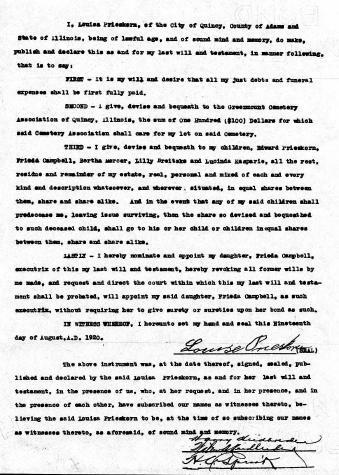 She left a will on 19 August 1920 at Adams, Illinois, will of Louisa Prieskorn. In August 1921 at Spring Green, Sauk, Wisconsin, Mrs Louise Prieskorn is visiting her daughter Mrs Fred Mercer. 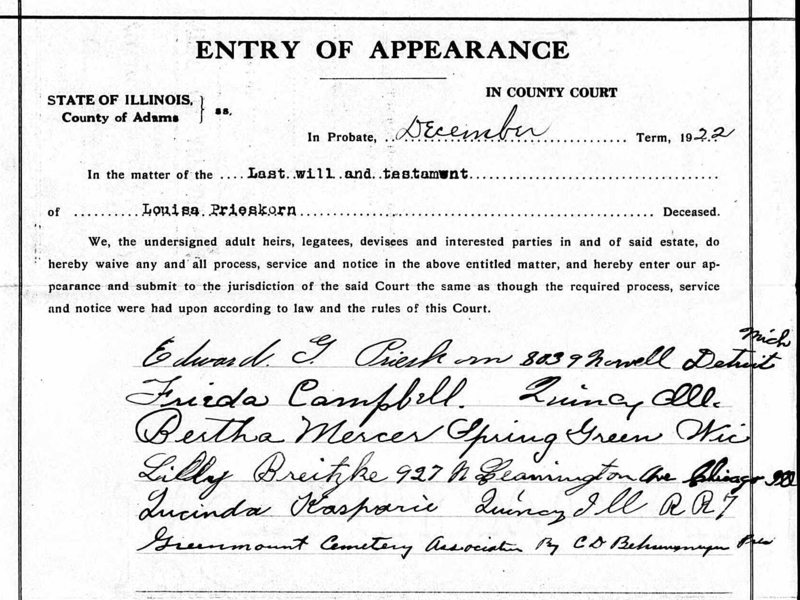 In December 1922 at Adams, Illinois, probate for will of Louisa Prieskorn. 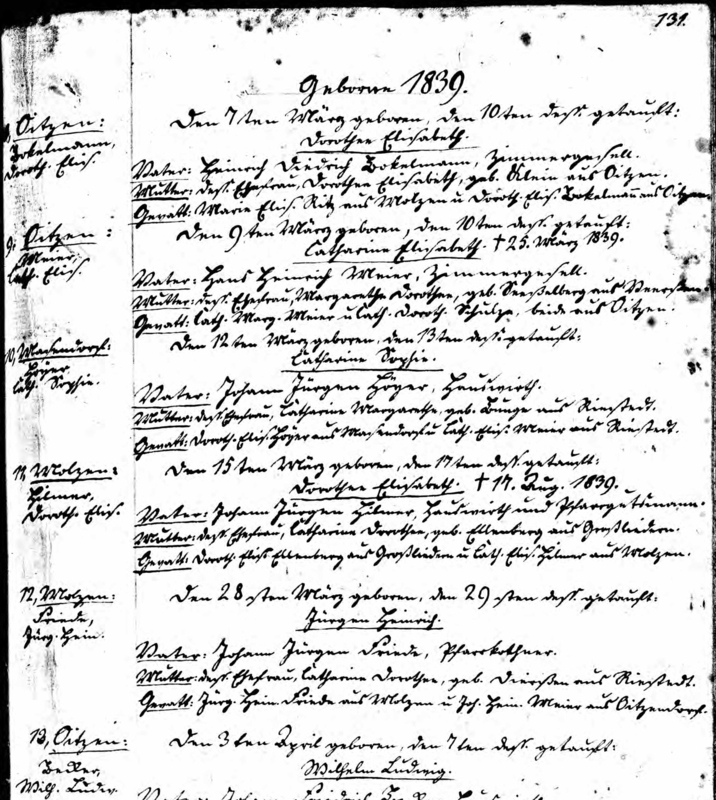 [S399] Germany Lutheran Church Archives Digital Archives, by Ancestry.com, birth date listed in daughter's baptism record. 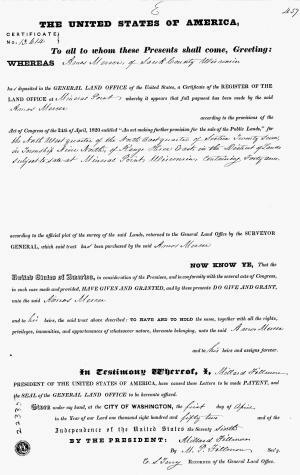 [S238] Illinois Death Records, by Illinois, certificate 6028754. 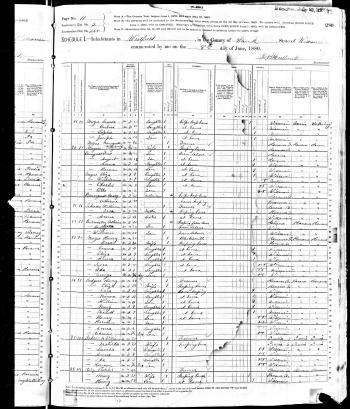 [S244] U.S. Federal Census 1910 U.S. Federal Census, by Ancestry.com, ED48. Dwelling 225. Stamp 209. Name Variation Jurgen Heinrich Friede was also known as Heinrich. 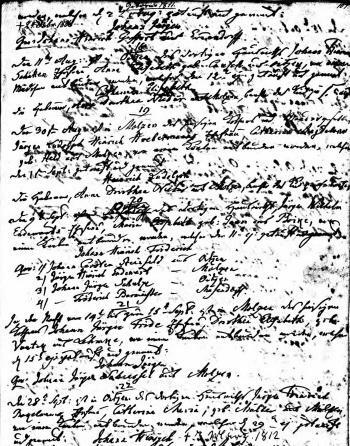 Name Variation Jurgen Heinrich Friede was also known as Heine. Name Variation Jurgen Heinrich Friede was also known as Henry Jurgen. Name Variation Jurgen Heinrich Friede was also known as J. H.
Jurgen Heinrich Friede died on 2 March 1908 at Reedsburg, Sauk, Wisconsin, at age 68. Ev.-Luth. 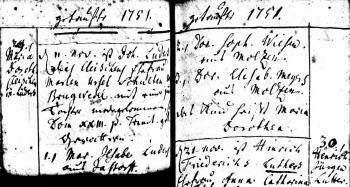 Kirchengemeinde Molzen3111 Molzen BEI Uelzen Pastor Haspelmath 21.11.75 TGB 117/75 Sehr geehrte Frau Friede: Jurgen Heinrich Friede, geboren am 28.3.1839 in Molzen, Sohn des Pfarrkotners Johann Jurgen Friede und seiner Ehefrau Catherine Dorothee, geb. 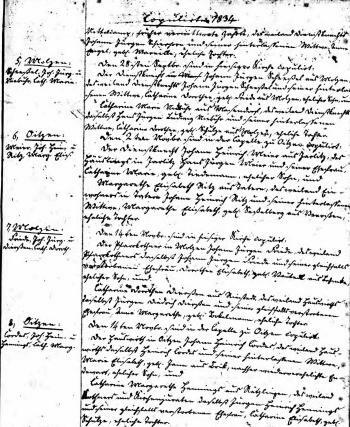 Dierssen (aus Riestedt), wurde in der Kirche Molzen am 29.3.1839 durch Pastor Prelle getauft.Taufpaten waren: Jurgen Heinrich Friede, Molzen Taufpaten Johann Heinrich Meier, Oetzendorf. 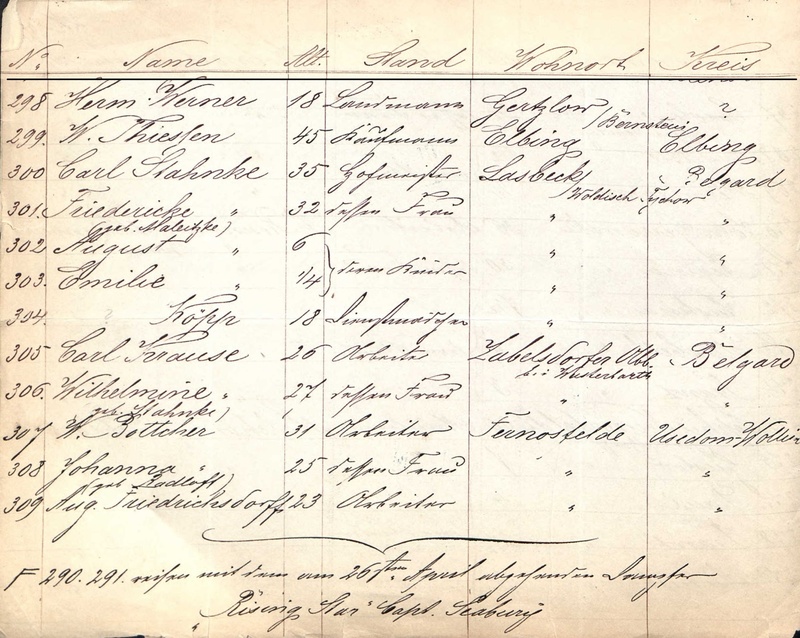 Er heiratete am 27.November 1863 in Molzen: Catherine Marie Elisabeth Meier auf Masendorf, Tochter des Kotners Jurgen Heinrich Meier, Masendorf, und Catherine Marie Elisabeth, geb. Peters. 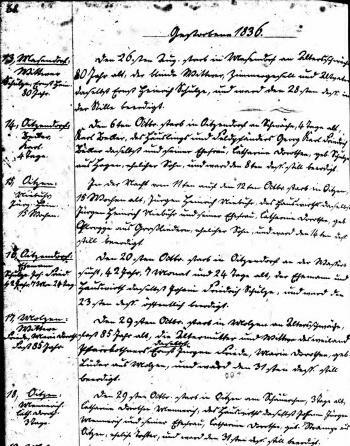 Sie war geboren in Gienau am 11.3.1844 Anbei 1 Karte des Dreises Uelzen. Mit freundlichen Grussen! 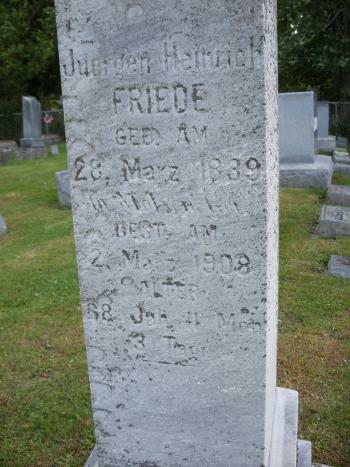 This translates to: Jurgen Heinrich Friede, born on 28 March 1839 in Molzen, son of the church Johann Jurgen Friede and his wife Catherine Dorothee, maiden name Dierssen (of Riestedt). 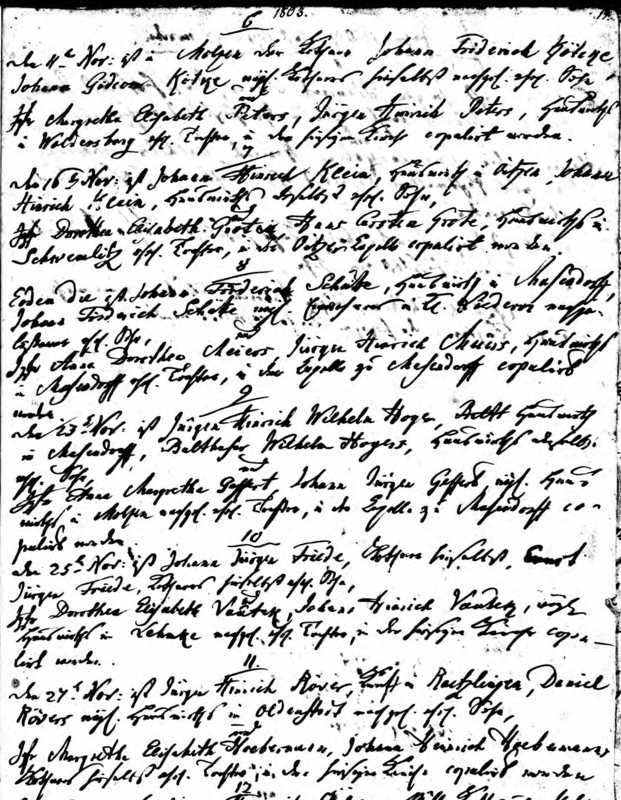 Title in the church of Molzen on 29 March 1839 by means of Pastor Prelle's christening. 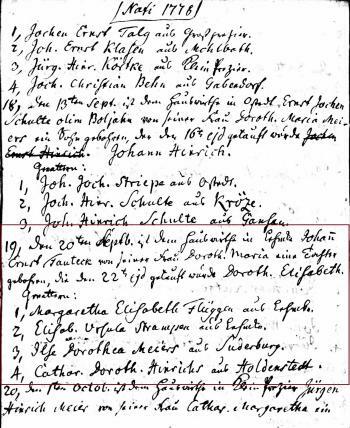 Godparents were: Jurgen Heinrich Friede, Molzen, Johann Heinrich Meier, Oetzendorf. 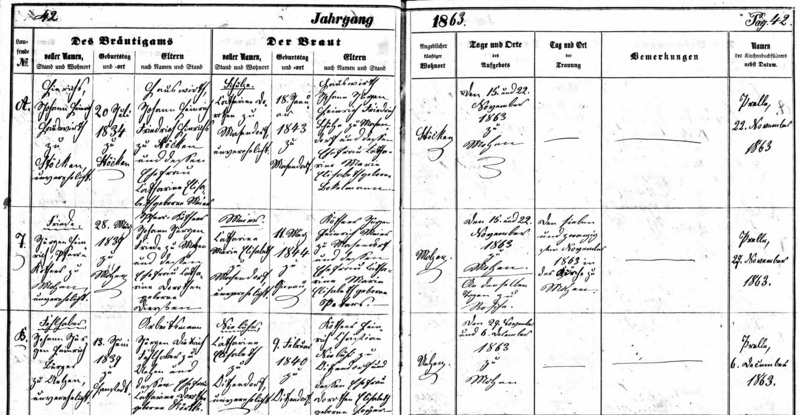 His marriage on 27 November 1863 in Molzen: Catherine Marie Elisabeth Meier, of Masendorf, daughter of Jurgen Heinrich Meier, Masendorf, and Catherine Marie Elisabeth, maiden name Peters. She was born in Gienau on 11 Mar 1844. Volume: 373-7 I, VIII A 1 Band 056 C.
Jurgen Heinrich Friede was a laborer in 1900. [S392] Lutheran Church, German Lutheran Church Records 1875-1940, Page Number: 130;131. 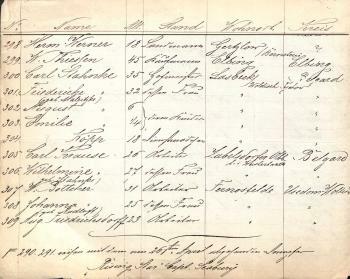 [S392] Lutheran Church, German Lutheran Church Records 1875-1940, Page Number: 42;42. 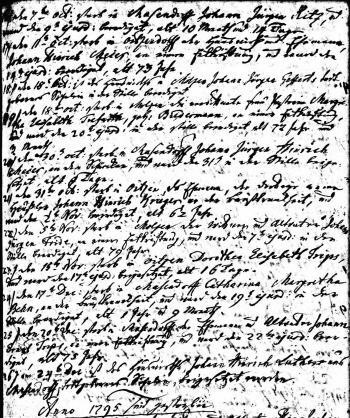 [S407] Lutheran Church, German Lutheran Church Records 1500-1971, Page 42;42. Film number 470787. 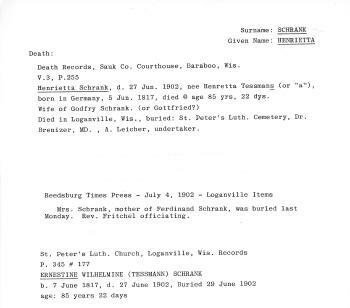 [S214] Wisconsin Sauk Co Cemetery Records Vol 9, Pg. 128. Name Variation Catharine Marie Elisabeth Meier Of Masendorf was also known as Mary. 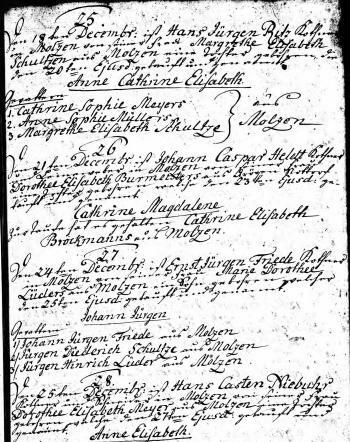 Name Variation Catharine Marie Elisabeth Meier Of Masendorf was also known as Kathrina Maria Elisabeth. 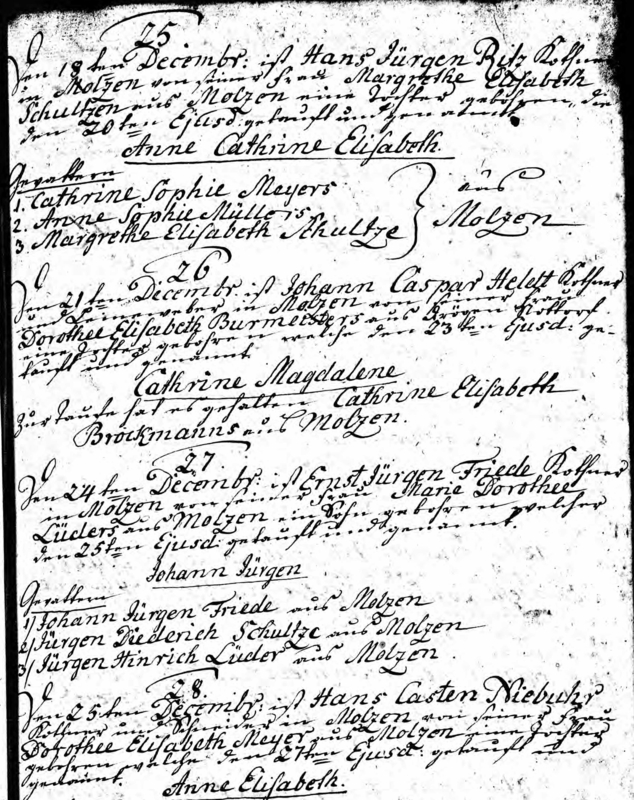 Name Variation Catharine Marie Elisabeth Meier Of Masendorf was also known as Meÿer. Nickname Catharine Marie Elisabeth Meier Of Masendorf also went by the name of Marie. Name Variation Catharine Marie Elisabeth Meier Of Masendorf was also known as Maria Frau Von Heinrich Meyer. 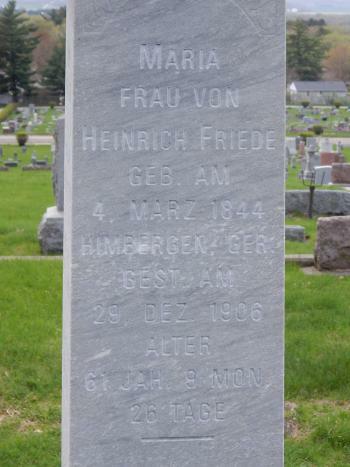 Married Name 27 November 1863 As of 27 November 1863,her married name was Friede. 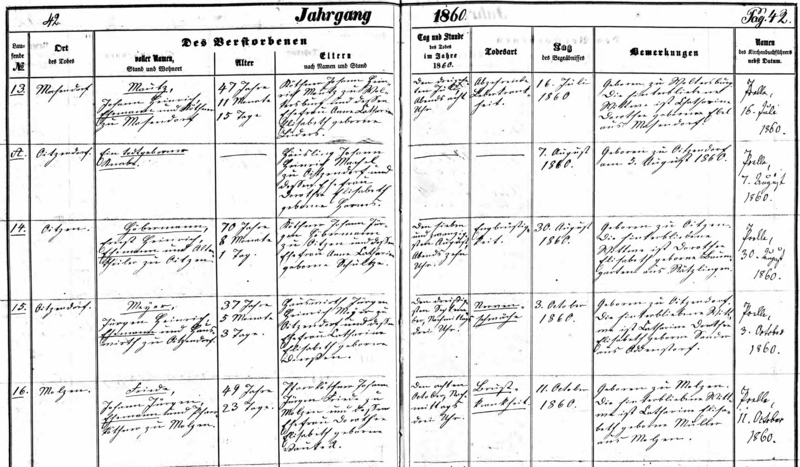 Catharine Marie Elisabeth Meier Of Masendorf was born on 11 March 1844 at Gienau, Dahlenburg, Lüneburg, Niedersachsen, Germany, also reported as 04 Mar 1844 Gienau-Himbergen, and 11 May 1844. She was the daughter of Jurgen Heinrich Meier and Catherine Marie Elisabeth Peters. [S386] Lutheran Church, Evangelical Lutheran Church Records 1875-1940, Indexed under St John's Reedsburg WI. 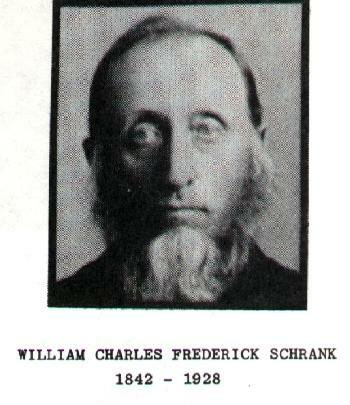 Name Variation William Charles Frederick Schrank was also known as Charles Friedrick William. 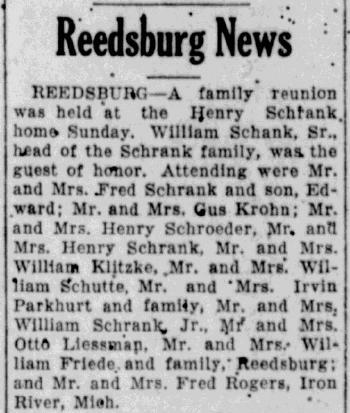 Name Variation William Charles Frederick Schrank was also known as Charles Fred. 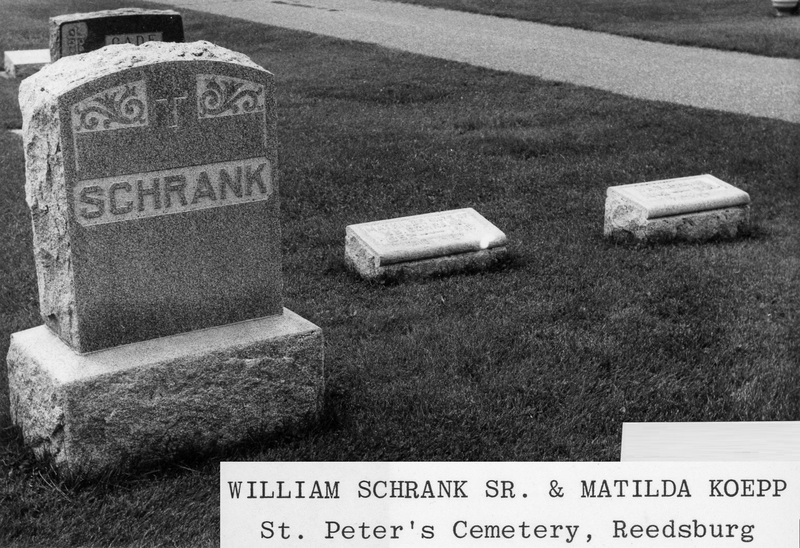 Name Variation William Charles Frederick Schrank was also known as Wilhelm Carl Friedrich. William Charles Frederick Schrank was born on 18 October 1842 at Gross Schoneberg (Groß Schönberg), Prussia, Germany, now Szczytniki, Drawsko County, Poland. He was the son of Gottfried Schrank and Ernestine Henretta Wilhelmine Tessmann. William Charles Frederick Schrank died on 19 December 1928 at Reedsburg, Sauk, Wisconsin, at age 86 William Schrank death notice. 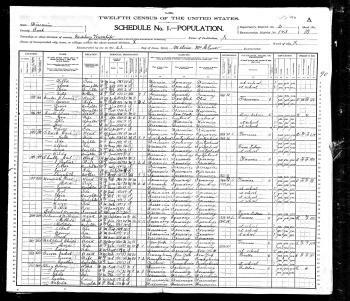 20 June 1895 Washington, Sauk, Wisconsin He appeared on the census of 20 June 1895 at Washington, Sauk, Wisconsin, 5 males, 3 females; 6 born in US, 2 born in Germany. 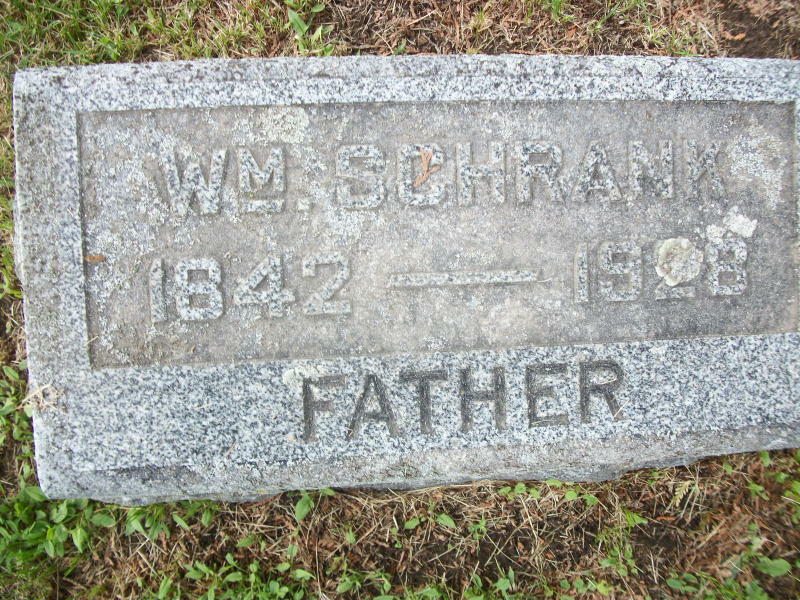 William (or Wilhelm, as he was Christened) Schrank was born in Gross Schonberg, Germany. This part of Pomerania, Germany, was ceded to Poland after WW II. The town is now called Szczytniki, Drawsko County, Poland. 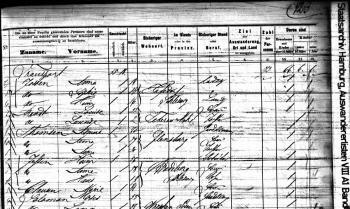 William left his home district to depart from the Port of Bremen, Germany on 19 May 1868. He sailed on the ship CARL and arrived in New York Harbor on 2 June 1868. He was 26 and single. 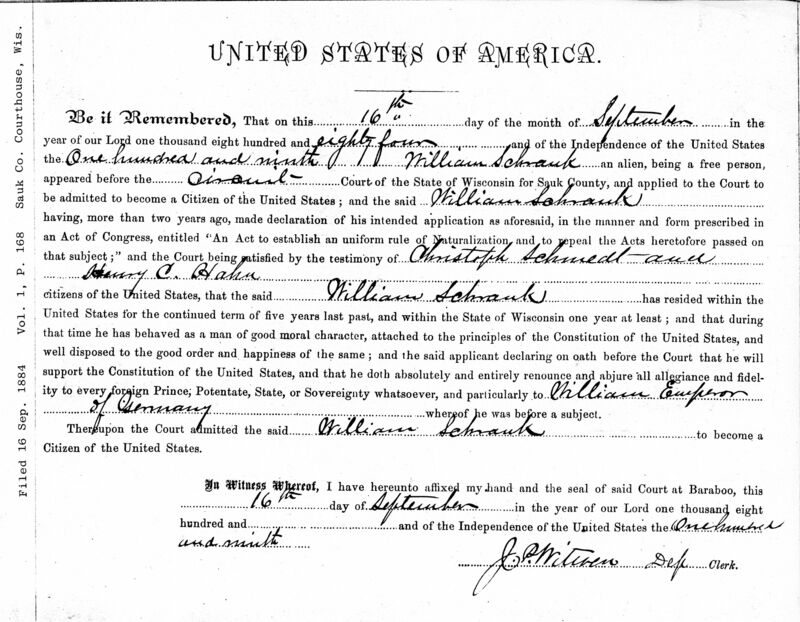 Eight years later, he finalized the paperwork and became a citizen of the United States on 16 Sept 1884.7 William and Matilda (Koepp) Schrank portrait. 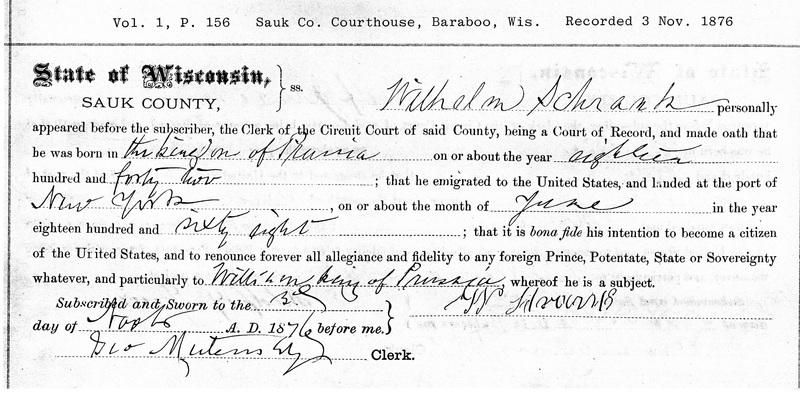 On 3 November 1876 at Circuit Court, Baraboo, Sauk, Wisconsin, Citizenship Application. He was a farmer in 1880. 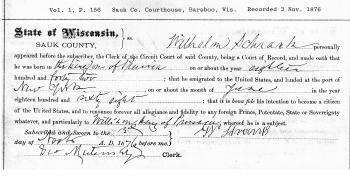 He was naturalized on 16 September 1884 at Baraboo, Sauk, Wisconsin. He was a farmer in 1900. He was a laborer in odd jobs in 1910. 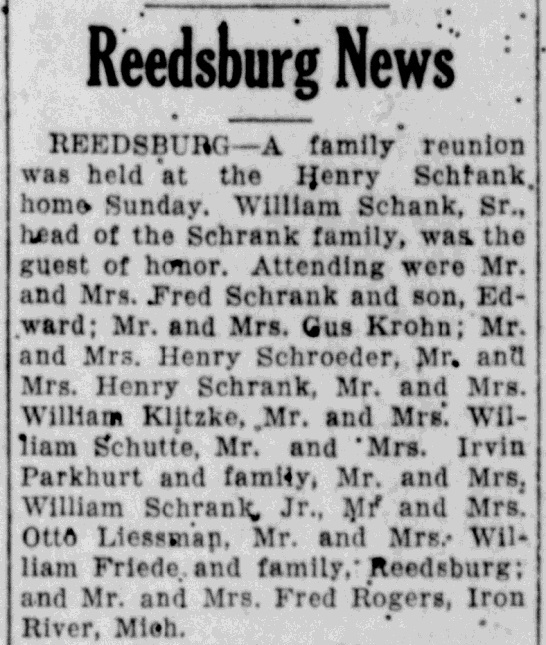 In March 1926 at at the Henry Schrank home, Sauk, Wisconsin, Schrank family reunion; guest of honor William Schrank Sr.
[S387] Family Search; Multiple Records, "Wisconsin, County Marriages, 1836-1911," database, FamilySearch (https://familysearch.org/ark:/61903/1:1:XR6D-SR7 : 3 June 2016), Chas. Friedrick Wm. Schrank and Augusta Matida Koepp, 04 Nov 1870; citing , Sauk, Wisconsin, United States, Wisconsin Historical Society, Madison; FHL microfilm 1,275,558. [S214] Wisconsin Sauk Co Cemetery Records Vol 9, Pg. 138. 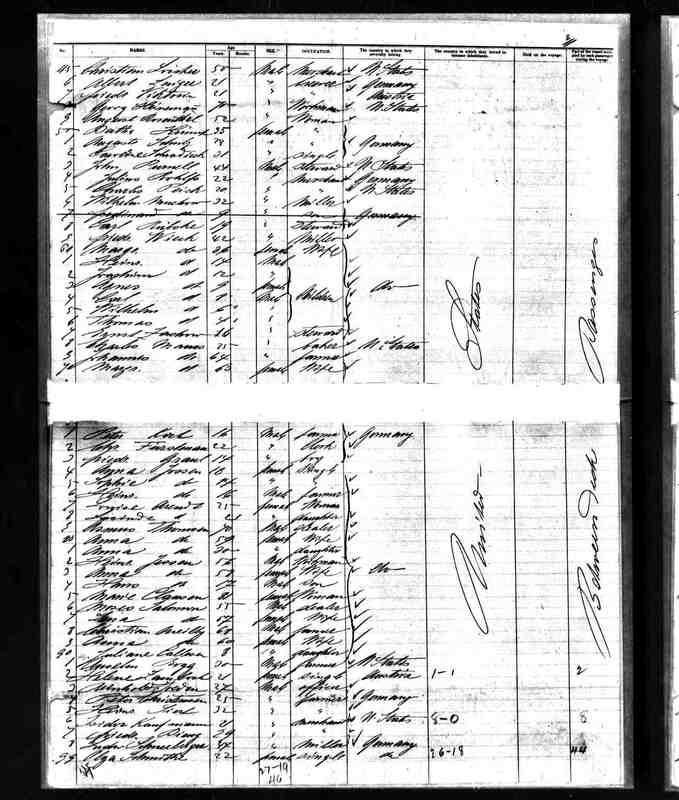 [S245] U.S. Federal Census 1900 U.S. Federal Census, by Ancestry.com, ED143. Dwelling 199. 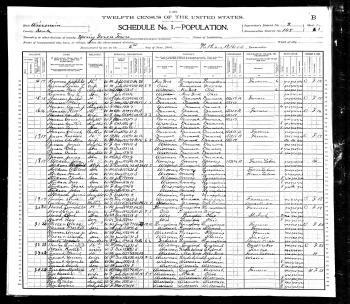 [S244] U.S. Federal Census 1910 U.S. Federal Census, by Ancestry.com, ED125. Dwelling 68. Name Variation Matilda Augusta Koepp was also known as Augusta Matilda. 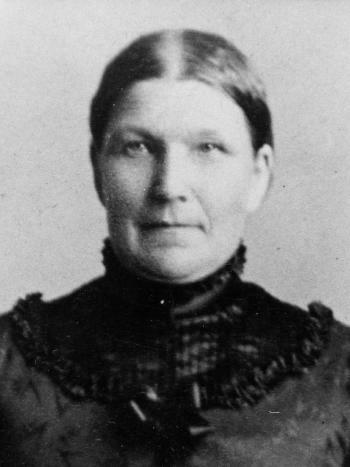 Name Variation Matilda Augusta Koepp was also known as Köpp. 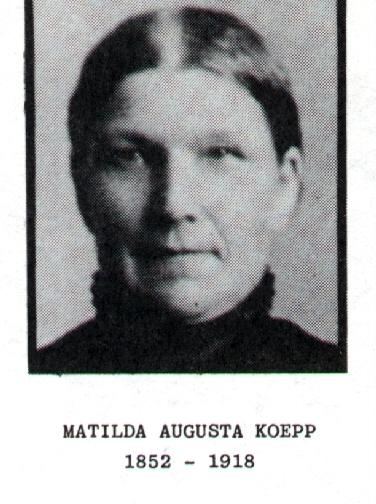 Name Variation Matilda Augusta Koepp was also known as Koeppe. Name Variation Matilda Augusta Koepp was also known as Tilda. Name Variation Matilda Augusta Koepp was also known as Mathilde. 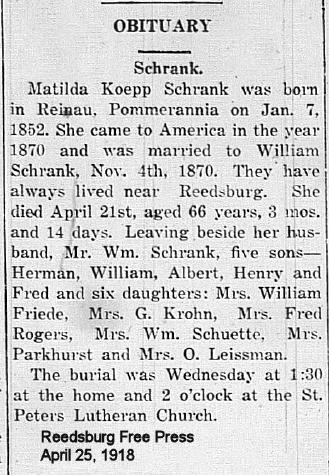 Name Variation Matilda Augusta Koepp was also known as Kopp. 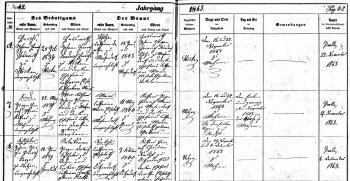 Married Name 4 November 1870 As of 4 November 1870,her married name was Schrank. Matilda Augusta Koepp was born on 7 January 1852 at Renau, Pommern (Pomerania), Germany. She was the daughter of Wilhelm Koepp and Jane (?). 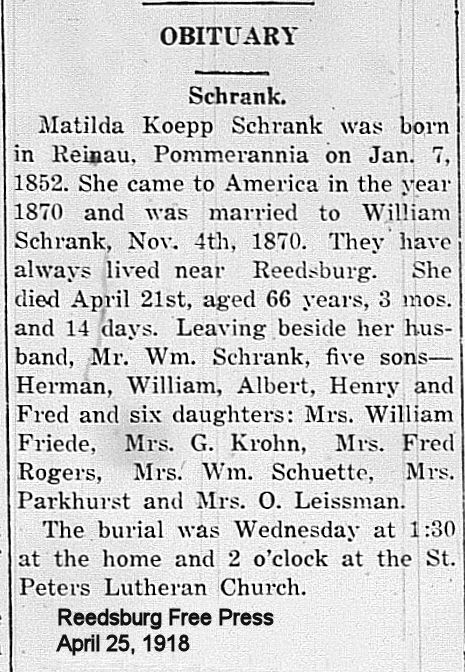 Matilda Augusta Koepp died on 21 April 1918 at Reedsburg, Sauk, Wisconsin, at age 66 Mrs William Schrank (Matilda Koepp) obituary. 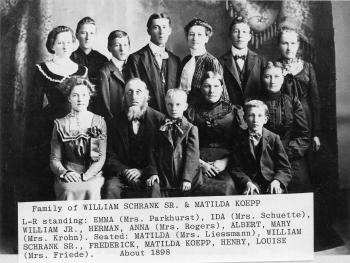 20 June 1895 Washington, Sauk, Wisconsin Matilda Augusta Koepp is counted on the census of 20 June 1895 in the household of William Charles Frederick Schrank at Washington, Sauk, Wisconsin; 5 males, 3 females; 6 born in US, 2 born in Germany. 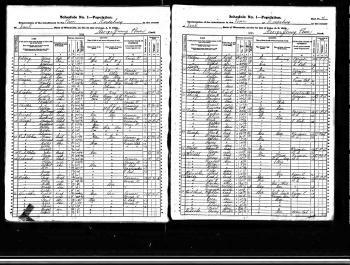 1 June 1905 Reedsburg, Sauk, Wisconsin Matilda Augusta Koepp appeared on the census of 1 June 1905 in the household of William Charles Frederick Schrank at Reedsburg, Sauk, Wisconsin. William and Matilda (Koepp) Schrank portrait. Matilda Koepp came to America in 1870. 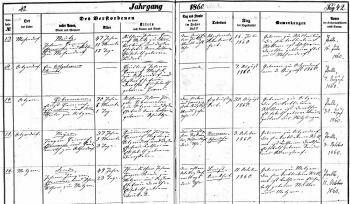 Matilda Augusta Koepp was born in Renau, Pomerania, Germany 7 Jan 1852, to John and Jane Koepp. 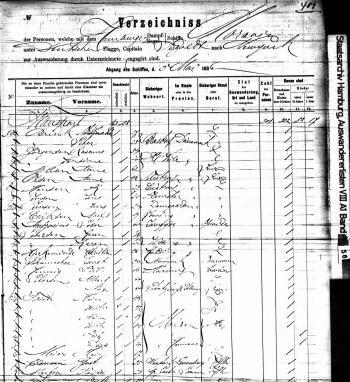 Matilda came to America in 1870 and was united in marriage to William Schrank that same year, on November 4.6 Matilda Augusta Koepp and Carl F. Stahnke lived in 1870 at Lasbeck Woldisch Fychow, Kreis Belgard, Köslin (or Körlin), Prussia (now Poland), as listed in ship departure records. 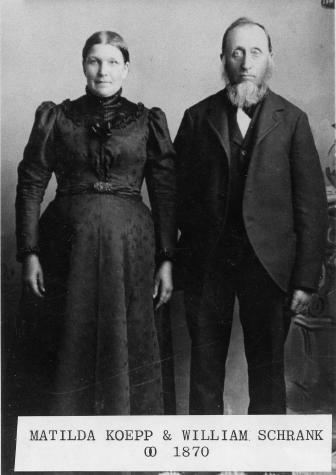 Matilda Augusta Koepp and Carl F. Stahnke immigrated on 2 April 1870 to Stettin, Germany (now Poland) to, Denmark, Mathilde Kopp came with the Carl Stanke family. Ship Name: Ocean Queen. Circa 1898 family photo. Matilda Augusta Koepp had 11 with 11 living in 1910 children. Name Variation Johann Jürgen Friede was also known as Johann Jurgen. Johann Jürgen Friede was born on 14 September 1811 at Molzen, Uelzen, Hanover, Germany. 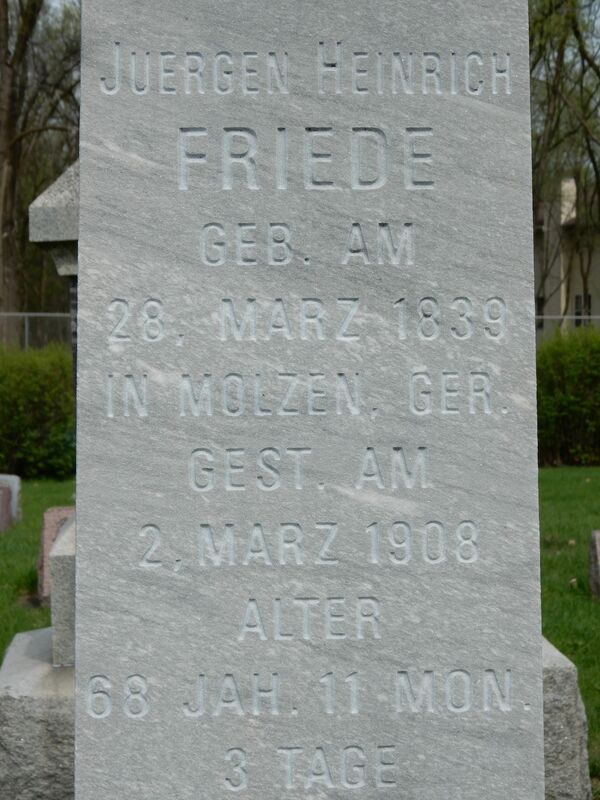 Johann Jürgen Friede died on 8 October 1860 at Molzen, Uelzen, Lower Saxony, Germany, at age 49 also listed as Moltzen. [S392] Lutheran Church, German Lutheran Church Records 1875-1940, Page Number: 107. [S392] Lutheran Church, German Lutheran Church Records 1875-1940, Page Number: 62. [S407] Lutheran Church, German Lutheran Church Records 1500-1971, Page 62. Film number 470786. [S392] Lutheran Church, German Lutheran Church Records 1875-1940, Page Number: 15. [S407] Lutheran Church, German Lutheran Church Records 1500-1971, Hannover Molzen Taufen, Heiraten, Tote u Konfirm 1733-1852. Image 207 of 525. Name Variation Catharine Dorothee Dierssen of Riestedt was also known as Dierßen. 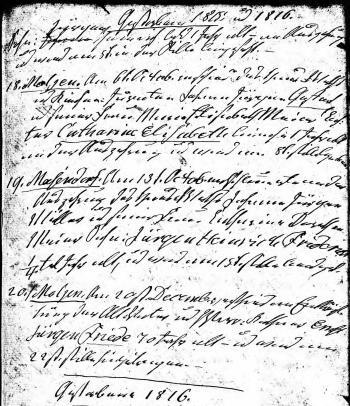 Married Name 14 November 1834 As of 14 November 1834,her married name was Friede of Riestedt. Catharine Dorothee Dierssen of Riestedt was born on 14 April 1813 at Reistedt, Rätzlingen, Uelzen, Lower-Saxony, Germany. She was the daughter of Jürgen Dietrich Dierks and Catharina Margaretha Bokelmann. [S392] Lutheran Church, German Lutheran Church Records 1875-1940, Page Number: 18;18. [S407] Lutheran Church, German Lutheran Church Records 1500-1971, Hannover Rätzlingen Taufen, Heiraten, Tote u Konfirmationen 1700-1852. Image 184 of 577, and 574 of 577. Name Variation Wilhelm Koepp was also known as Johann. Name Variation Wilhelm Koepp was also known as William. Name Variation Wilhelm Koepp was also known as John. Name Variation Wilhelm Koepp was also known as Koeppe. Wilhelm Koepp was born at Germany. Wilhelm Koepp married Jane (?). 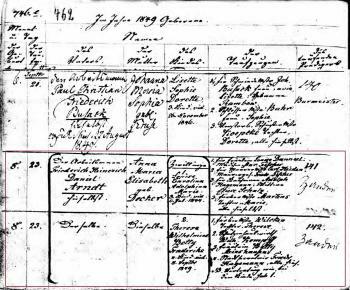 From daughter Matilde's death certificate. Name Variation Gottfried Schrank was also known as Berent. Name Variation Gottfried Schrank was also known as Arnold. Name Variation Gottfried Schrank was also known as Godfry. Gottfried Schrank was born circa 1814 at Gross Schonberg (Groß Schönberg), Dramburg, Germany, now Szczytniki, Drawsko County, Poland. 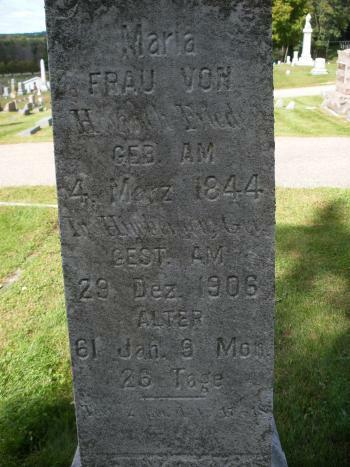 He married Ernestine Henretta Wilhelmine Tessmann circa 1842 at Germany. Gottfried Schrank died after 1882 at USA. Name Variation Ernestine Henretta Wilhelmine Tessmann was also known as Teßmann. Name Variation Ernestine Henretta Wilhelmine Tessmann was also known as Henrietta. 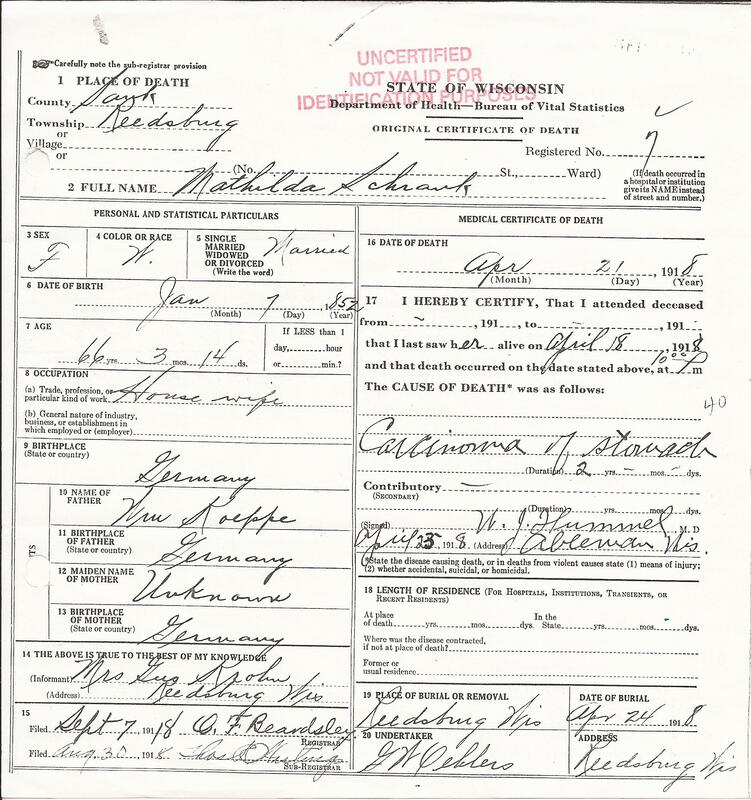 Name Variation Ernestine Henretta Wilhelmine Tessmann was also known as Henretta. 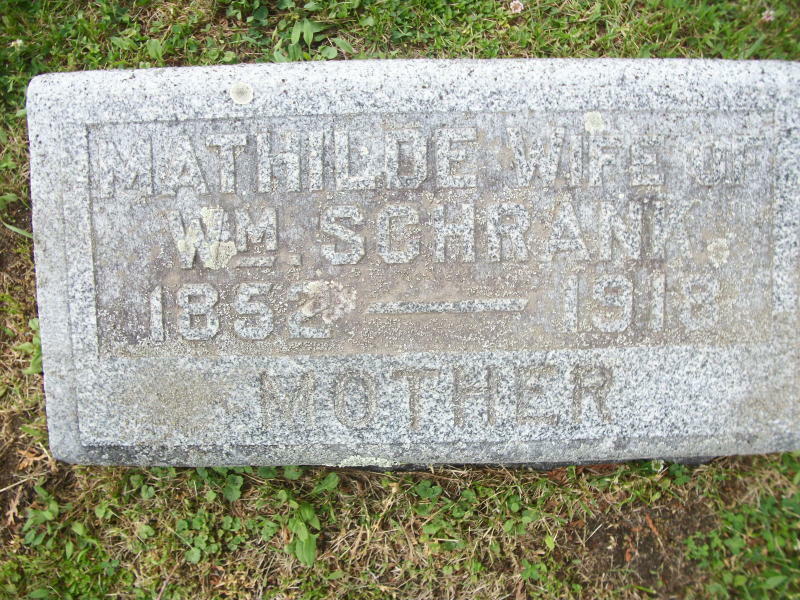 Married Name circa 1842 As of circa 1842,her married name was Schrank. Ernestine Henretta Wilhelmine Tessmann was born on 5 June 1817 at Ritzig (or Ritzin), Schivelbien, Pommern (Pomerania), Germany, Stare Resko (the former village Ritzig) is about 10 miles southeast of Swidwin (previously Schivelbein). Stare Resko (German: Ritzig) is a settlement in the administrative district of Gmina Polczyn-Zdrój, within Swidwin County, West Pomeranian Voivodeship, in north-western Poland. She married Gottfried Schrank circa 1842 at Germany. 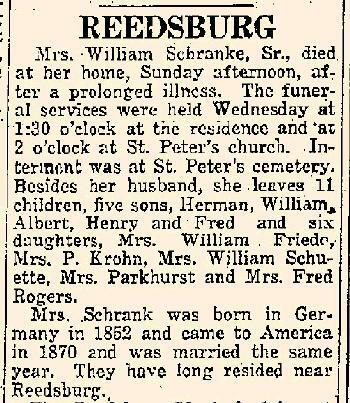 She was buried on 29 June 1902 at St. Peter's Lutheran Church, Loganville, Sauk, Wisconsin, Previously listed cemetery as St Peter's in Reedsburg, but that is incorrect. 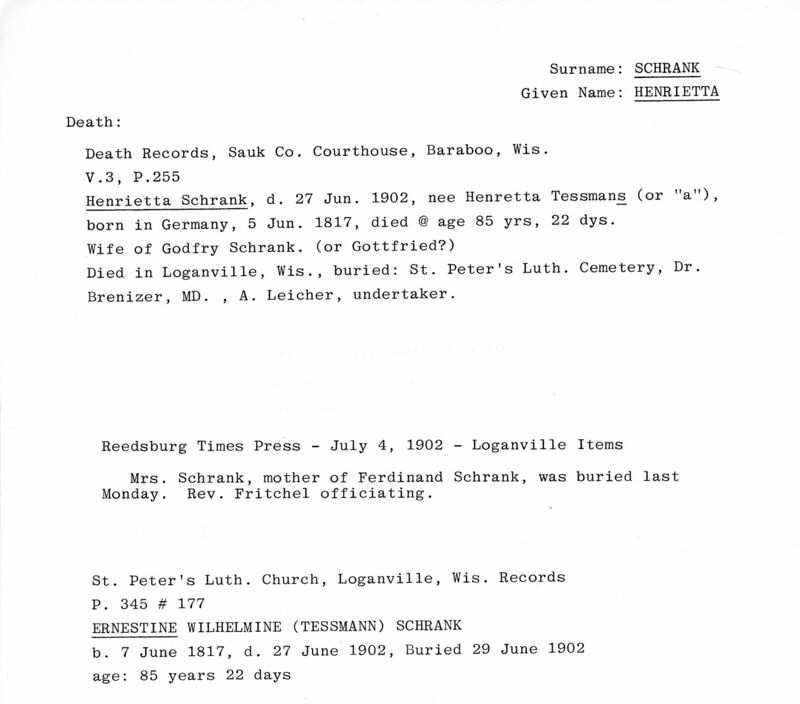 In the death record the entries above and below Ernestine's are both from burials in St Peter's in Loganville (confirmed by tombstone photos on FindAGrave). Name Variation Johann Jürgen Friede was also known as Fride. Name Variation Johann Jürgen Friede was also known as Friden. Name Variation Johann Jürgen Friede was also known as Johann Jurgen Friede. 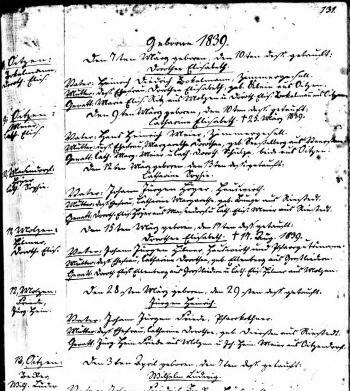 Johann Jürgen Friede was born on 24 December 1778 at Molzen, Uelzen, Hanover, Germany. 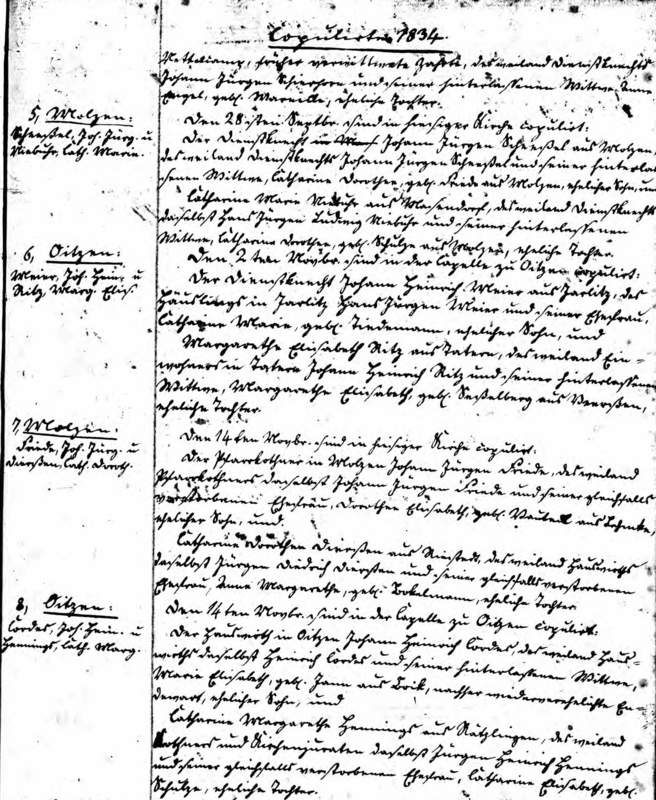 Johann Jürgen Friede died on 25 April 1830 at Molzen, Uelzen, Lower-Saxony, Germany, at age 51 also reported as Moltzen. [S407] Lutheran Church, German Lutheran Church Records 1500-1971, Film number 470786. Name Variation Dorothee Elizabeth Fauteck was also known as Vauteck. Name Variation Dorothee Elizabeth Fauteck was also known as Vautek. 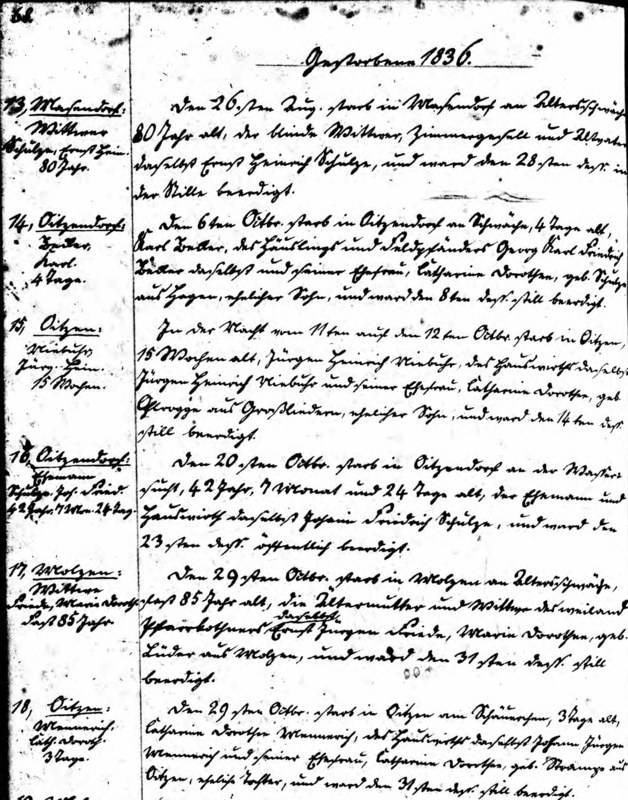 Married Name 25 November 1803 As of 25 November 1803,her married name was Friede. 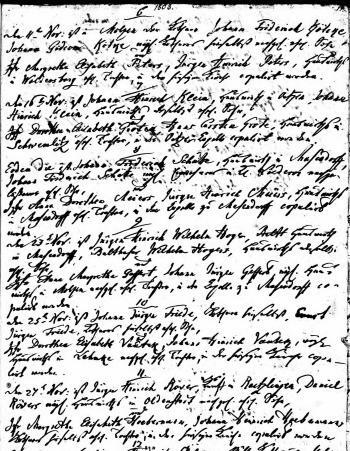 Married Name 25 November 1803 As of 25 November 1803,her married name was Fride. She was the daughter of Johann Ernst Fauteck and Dorothea Maria Müller. [S407] Lutheran Church, German Lutheran Church Records 1500-1971, Film number 473866. Hannover Lehmke Taufen, Heiraten u Tote 1708-1759. Image 403 of 410. Name Variation Ernst Jürgen Friede was also known as Jürgen Ernst Friede. Name Variation Ernst Jürgen Friede was also known as Ernest Jurgen Friede. Mr. Friede was a PfarrKothner and Schuster. (Schuster=shoemaker) They had 7 children. 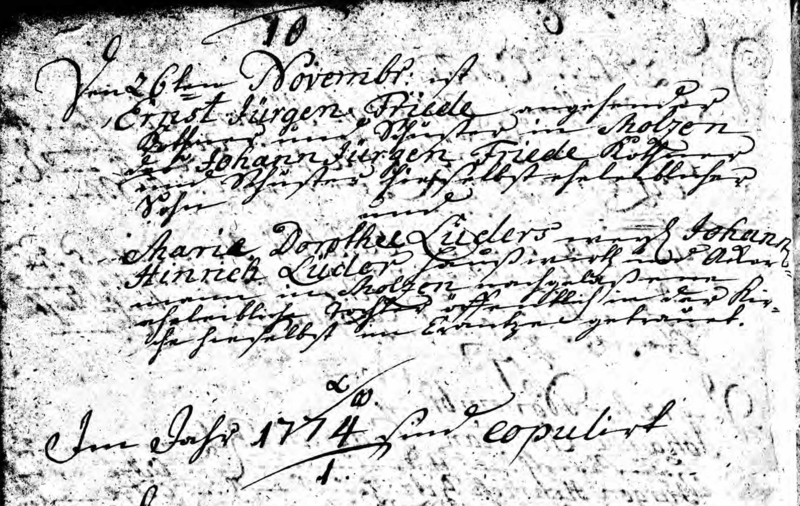 Name Variation Marie Dorothee Lüders was also known as Cleischauf in her baptism record, lists father as Johann Luders alias Cleischauf. Name Variation Marie Dorothee Lüders was also known as Maria Dorothea. Name Variation Marie Dorothee Lüders was also known as Dorothea Maria. Name Variation Marie Dorothee Lüders was also known as Lüder. Name Variation Marie Dorothee Lüders was also known as Luders. 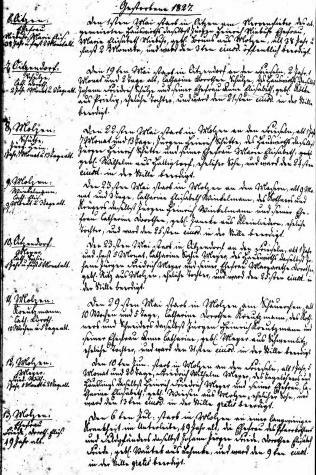 Married Name 26 November 1773 As of 26 November 1773,her married name was Friede. She was the daughter of Johann Hinrich Wilhelm Lüders and Magdalena Ursul Schultzen. [S392] Lutheran Church, German Lutheran Church Records 1875-1940, Page Number: 68. [S407] Lutheran Church, German Lutheran Church Records 1500-1971, Image 188 of 525: Hannover Molzen Taufen, Heiraten, Tote u Konfirm 1733-1852. Johann Jürgen Friede was born in 1715 at Germany. He was the son of Peter Frede and Magdalena Dorothea Klinitz. He was a Kothner&Schuster (Schuster = shoemaker). 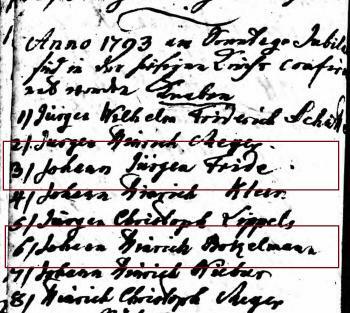 Johann Jürgen Friede lived in 1741 at Uelzen, Uelzen, Hanover, Germany, occupation Schuster (shoemaker). 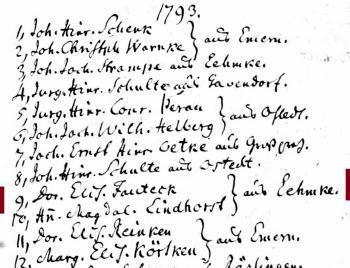 He lived in 1749 at Masendorff, Uelzen, Hanover, Germany. Married Name 5 November 1741 As of 5 November 1741,her married name was Friden. 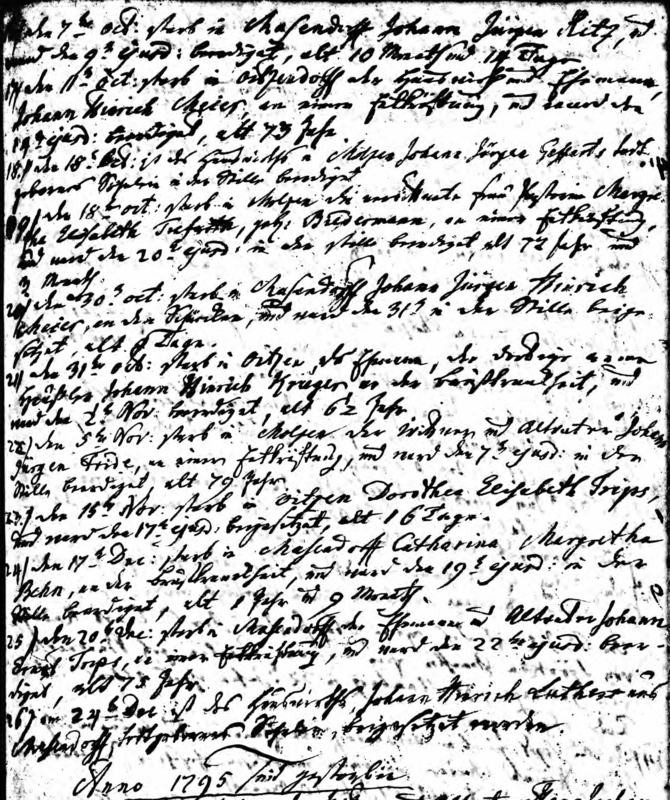 Married Name 5 November 1741 As of 5 November 1741,her married name was Friede. 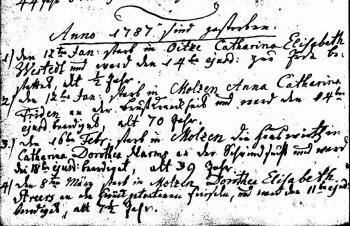 Anna Catharina Schultzen was born in 1717 at Germany. 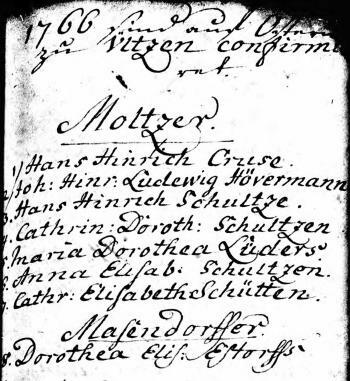 Anna Catharina Schultzen lived in 1741 at Masendorff, Uelzen, Hanover, Germany. 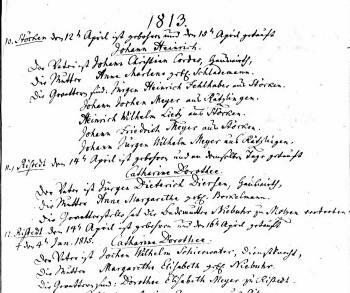 Peter Frede married Magdalena Dorothea Klinitz may not have married; daughter Anna Margaretha listed as illegitimate in baptism record. 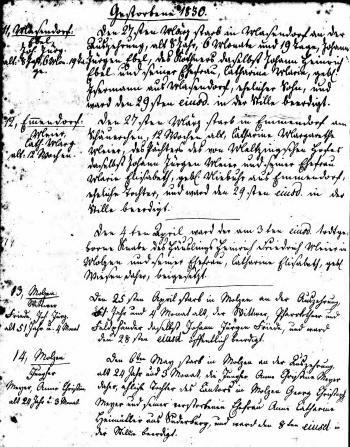 Peter Frede was born before 1700 at Germany. This is the first instance of the name Frede instead of Friede. Married Name Her married name was Frede. 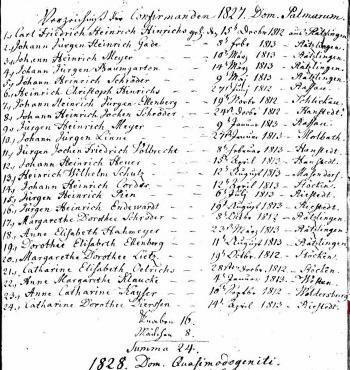 Magdalena Dorothea Klinitz married Peter Frede may not have married; daughter Anna Margaretha listed as illegitimate in baptism record. 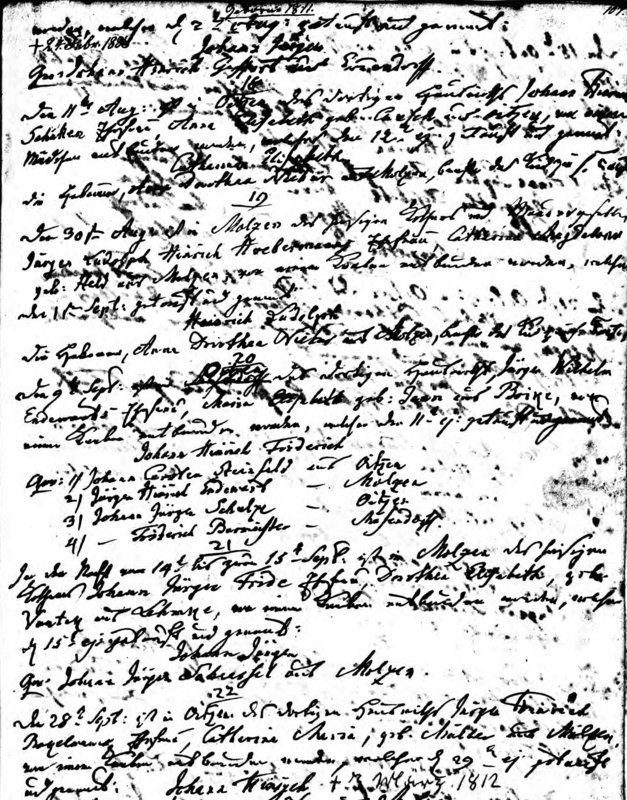 Magdalena Dorothea Klinitz was born before 1700 at Germany. John H. Richard was born at Wisconsin on 16 January 1892; also reported as 16 Jan 1891. He was the son of Bart Richard and Anna Barbara Uthe. As of 1974, John H. Richard was never married. 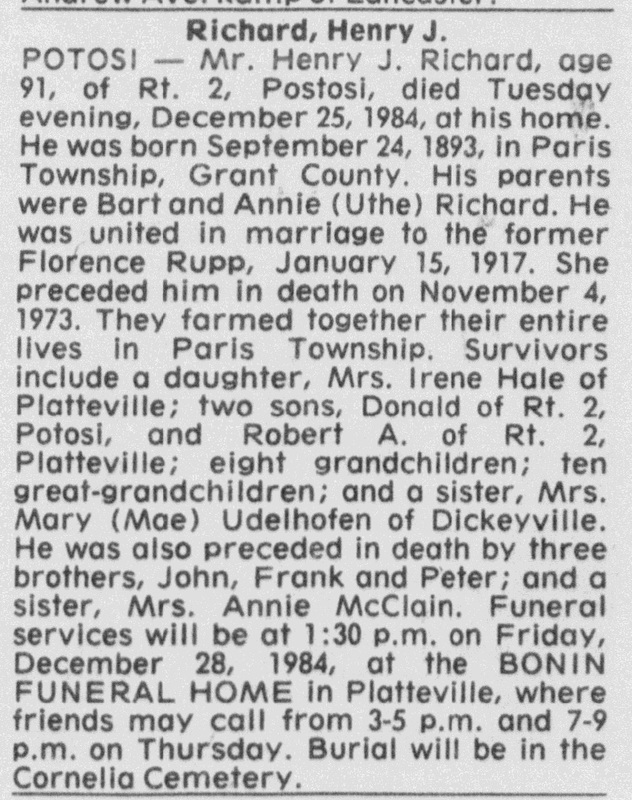 He died on 9 October 1974 at Municipal Hospital, Platteville, Grant, Wisconsin, at age 82 John H. Richard, 82, of Route 2, Potosi, Wisconsin, died Wednesday, October 9, 1974, at Municipal Hospital in Platteville, Wisconsin. Visitation was after 4 p.m., Thursday, October 10, at the Thomas-Bonin-Soman Funeral Home in Platteville. Funeral services were at 10:30 a.m., Friday, October 11, at Holy Ghost Catholic Church in Dickeyville, Wisconsin, and burial was in the church cemetery. 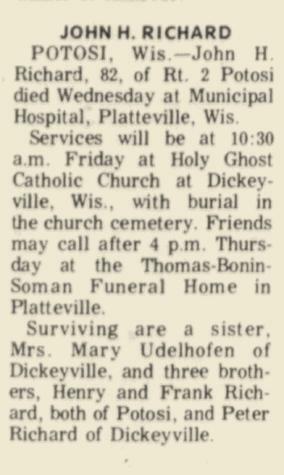 Mr. Richard was survived by a sister, Mrs. Mary Udelhofen, of Dickeyville, Wis., and three brothers, Henry Richard and Frank Richard, both of Potosi, Wis., and Peter Richard, of Dickeyville, Wis. He was buried on 11 October 1974 at Holy Ghost Cemetery aka Dickeyville Cemetery, Dickeyville, Grant, Wisconsin. John H. Richard obtained US Social Security Card at Wisconsin; last residence Potosi, Grant, Wisconsin. 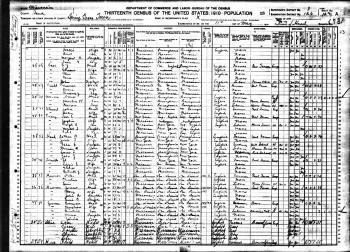 [S243] U.S. Federal Census 1920 U.S. Federal Census, by Ancestry.com, ED118. Dwelling 133. 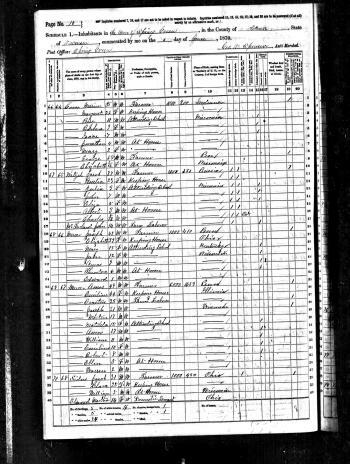 [S250] U.S. Federal Census 1930 U.S. Federal Census, by Ancestry.com, ED22-37. Dwelling 101. 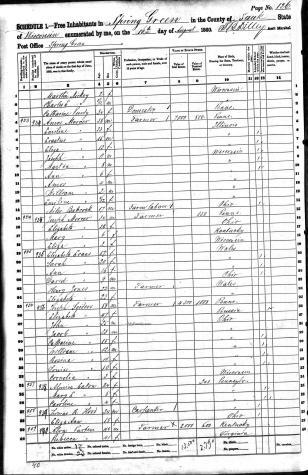 [S373] U.S. Federal Census 1940 U.S. Federal Census, by Ancestry.com, ED22-37. Dwelling 158. Sheet 9a. Name Variation Henry John Richard was also known as Richards. Name Variation Henry John Richard was also known as John Henry. 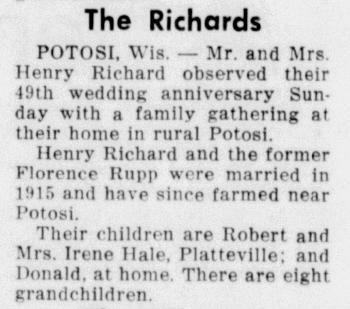 Henry John Richard married Florence Ann Rupp, daughter of Antone J. Rupp and Laura McClain, on 16 January 1917 at Dickeyville, Grant, Wisconsin. Henry John Richard died on 25 December 1984 at Potosi, Grant, Wisconsin, at age 91 Henry Richard, 91, of Route 2, Potosi, Wisconsin, died Tuesday evening, December 25, 1984, at home. Visitation was from 3 to 5 p.m. and from 7 to 9 p.m., Thursday, December 27, at the Bonin Funeral Home in Platteville, Wisconsin. Services were at 1:30 p.m., Friday, December 28, at the funeral home. 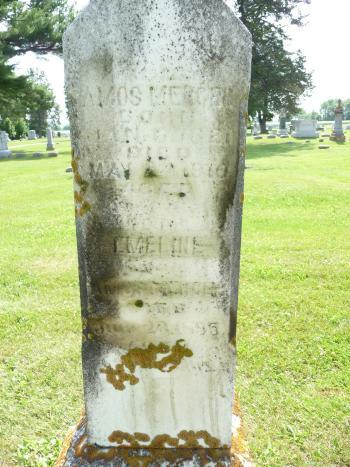 Burial was in Cornelia Cemetery in Cornelia, Wisconsin. 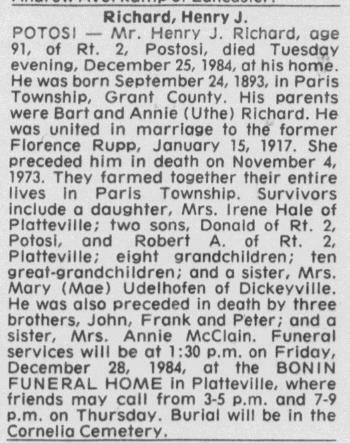 Mr. Richard was survived by a daughter, Mrs. Irene Hale, of Platteville, Wis; two sons, Donald Richard, of Route 2, Potosi, Wis., and Robert A. Richards, of Route 2, Platteville, Wis; 8 grandchildren and 10 great-grandchildren; and a sister, Mrs. Mary "Mame" Udelhofen, of Dickeyville, Wis. He was buried on 28 December 1984 at Mount Zion Cemetery aka Cornelia Cemetery, Cornelia, Grant, Wisconsin. 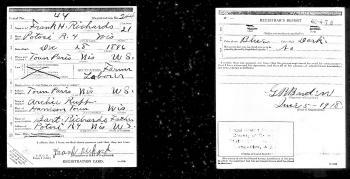 Henry John Richard obtained US Social Security Card at Wisconsin; last residence Potosi, Grant, Wisconsin. On 5 June 1917 at WWI Registration, Grant, Wisconsin. He was educated in 1940 at through 7th grade. 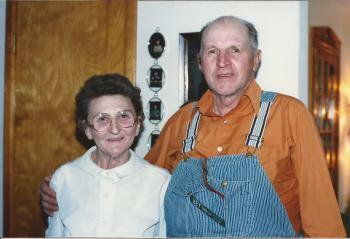 In January 1966 at Potosi, Grant, Wisconsin, Mr and Mrs Henry Richard (Florence Rupp) celebrate 49th wedding anniversary. 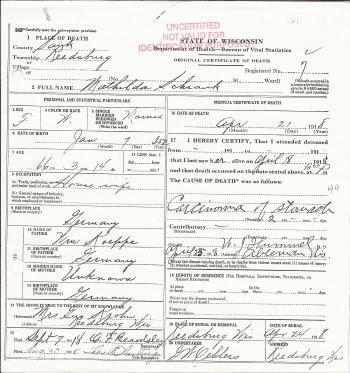 [S387] Family Search; Multiple Records, "Wisconsin Births and Christenings, 1826-1926," database, FamilySearch (https://familysearch.org/ark:/61903/1:1:XRBC-YBZ : 12 December 2014), Bartholomew Richard in entry for Henry John Richard, 23 Sep 1893; citing Paris, Grant, Wisconsin, reference ; FHL microfilm 1,302,874. Frank Herman Richard died on 28 June 1981 at Lancaster Nursing Home, Lancaster, Wisconsin, at age 84 Frank H. Richard, 84, of Potosi, Wisconsin, died Sunday afternoon, June 28, 1981, at the Lancaster Nursing Home in Lancaster, Wisconsin. Visitation was from 4 to 9 p.m., Tuesday, June 30, at the Metcalfe-Kuenster Funeral Home in Potosi. Services were at 1:30 p.m., Wednesday, July 1, at the funeral home. Burial was in British Hollow Cemetery in British Hollow, Wisconsin, where military honors were accorded by the Potosi American Legion Post No. 473. 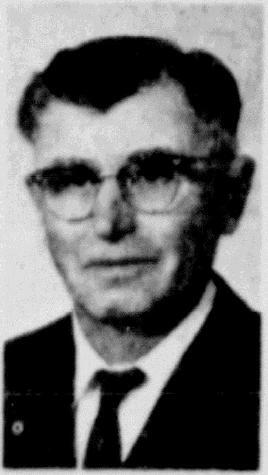 Mr. Richard was survived by two stepsons, Glen "Jack" Fritz, of Lake Mills, Wis., and Kenneth Fritz, of Potosi, Wis; 16 stepgrandchildren; a brother, Henry Richard, of Potosi, Wis; and a sister, Mary "Mame" Udelhofen, of Dickeyville, Wis. He was buried on 1 July 1981 at British Hollow Cemetery, British Hollow, Grant, Wisconsin. 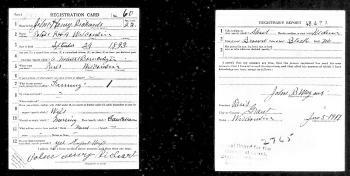 Frank Herman Richard obtained US Social Security Card at Wisconsin; last residence Potosi, Grant, Wisconsin. 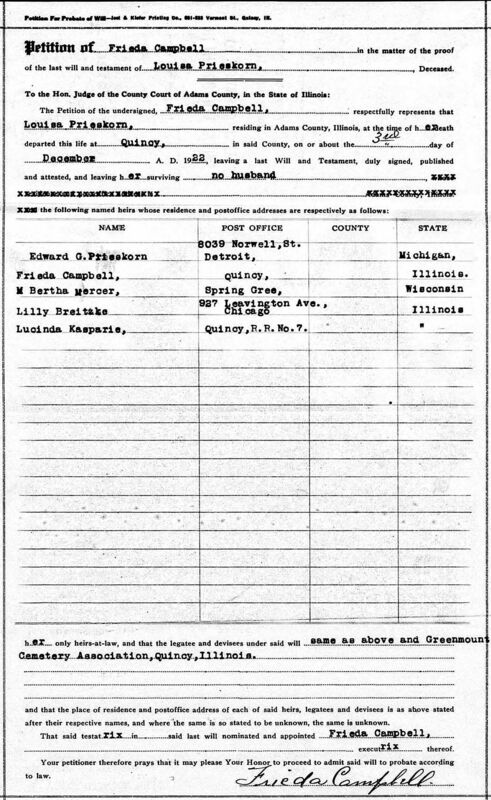 On 5 June 1918 at WWI Registration, Grant, Wisconsin. 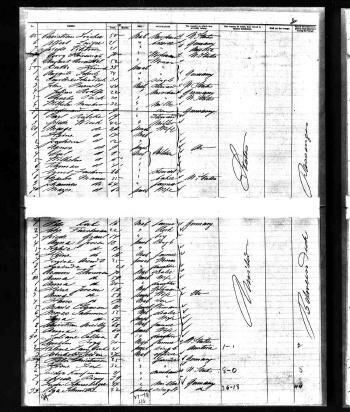 [S387] Family Search; Multiple Records, "Wisconsin Births and Christenings, 1826-1926," database, FamilySearch (https://familysearch.org/ark:/61903/1:1:XRJG-WJK : 12 December 2014), Anna Uthe in entry for Frank Herman Richard, 31 Dec 1896; citing Paris, Grant, Wisconsin, reference item 3 p 5; FHL microfilm 1,302,874. 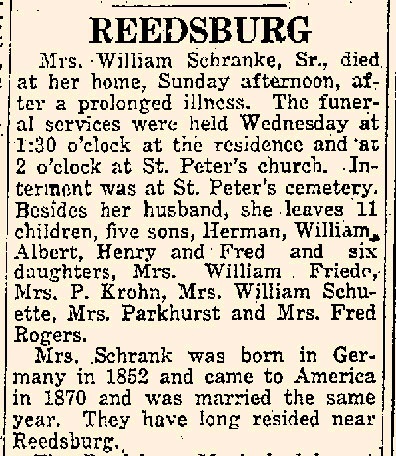 Peter Richard married Wilma L. Fritz, daughter of William C. Fritz and Margaret E. Leindecker, on 16 October 1934. 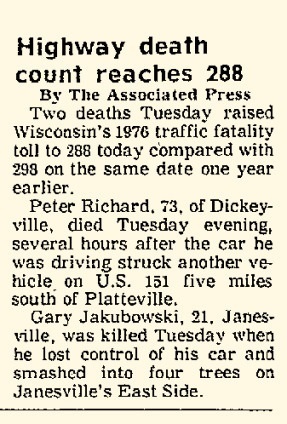 Peter Richard died on 25 May 1976 at Municipal Hospital, Platteville, Grant, Wisconsin, at age 72 Peter Richard, 72, of Center Street in Dickeyville, Wisconsin, died Tuesday evening, May 25, 1976, at Municipal Hospital in Platteville, Wisconsin, of injuries sustained in an auto accident. Mr. Richard's car collided Tuesday afternoon, May 25, with another auto on Highway 151 about five miles south of Platteville. Grant County sheriff's deputies said the other auto was turning left into a mobile home court entrance drive when his car was struck from behind by Richard's auto. Visitation was after 3 p.m., Thursday, May 27, at the Metcalfe-Kuenster Funeral Home in Potosi, Wisconsin. Services were at 11 a.m., Friday, May 28, at the funeral home. Burial was in British Hollow Cemetery in British Hollow, Wisconsin. 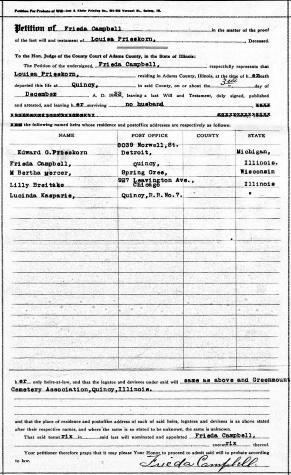 Mr. Richard was survived by a sister, Mrs. Frank Udelhofen, of Dickeyville, Wis., and two brothers, Henry Richard and Frank Richard, both of Potosi, Wis. He was buried after 25 May 1976 at British Hollow Cemetery, British Hollow, Grant, Wisconsin. Peter Richard obtained US Social Security Card at Wisconsin; last residence Dickeyville, Grant, Wisconsin. 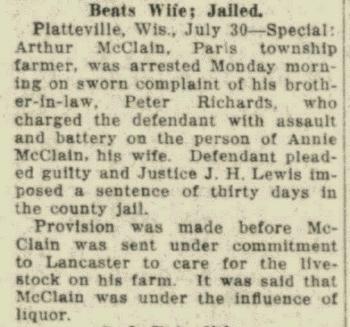 In July 1929 at Platteville, Grant, Wisconsin, Arthur McClain, Paris township farmer, was arrested Monday morning on sworn complaint of his brother-in-law, Peter Richards, who charged the defendant with assault and battery on the person of Annie McClain, his wife. Defendant pleaded guilty and Justice J. H. Lewis imposed a sentence of 30 days in the county jail. Provision was made before McClain was sent under commitment to Lancaster to care for the livestock on his farm. It was said that McClain was under the influence of liquor. He was educated in 1940 at through 8th grade. 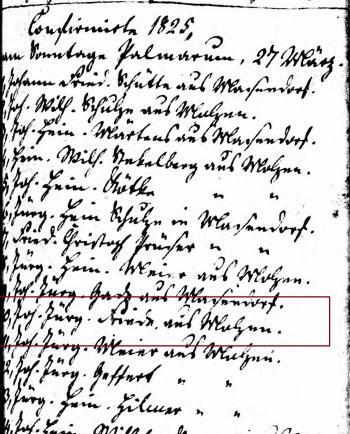 [S387] Family Search; Multiple Records, "Wisconsin Births and Christenings, 1826-1926," database, FamilySearch (https://familysearch.org/ark:/61903/1:1:XRJ5-6B4 : 12 December 2014), Bartholomeus Richard in entry for Peter Richard, 17 Jul 1903; citing Paris, Green, Wisconsin, reference item 1 p 512; FHL microfilm 1,302,875. 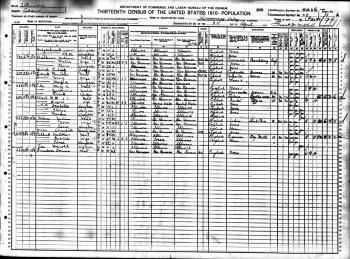 [S373] U.S. Federal Census 1940 U.S. Federal Census, by Ancestry.com, ED22-37. Dwelling 138. Sheet 8a. Name Variation Willie H. Richart was also known as William H. Richard. 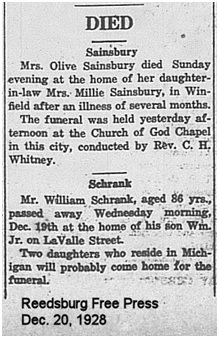 He was buried after 22 November 1903 at Holy Ghost Cemetery, Dickeyville, Grant, Wisconsin. 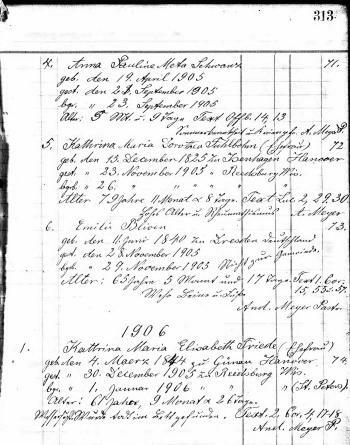 [S387] Family Search; Multiple Records, "Wisconsin Births and Christenings, 1826-1926," database, FamilySearch (https://familysearch.org/ark:/61903/1:1:XRJ5-6BQ : 12 December 2014), Bartholomeus Richard in entry for William Richard, 17 Jul 1903; citing Paris, Green, Wisconsin, reference item 1 p 512; FHL microfilm 1,302,875. 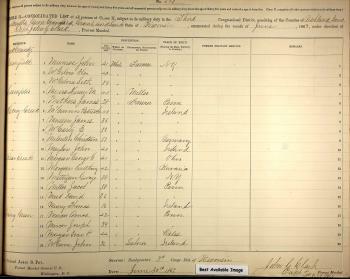 [S387] Family Search; Multiple Records, "Wisconsin, Death Records, 1867-1907," database, FamilySearch (https://familysearch.org/ark:/61903/1:1:XL79-QF9 : 4 December 2014), Bartt Richard in entry for William Richard, 1903; citing Death, Paris, Grant, Wisconsin, Wisconsin State Historical Society, Madison; FHL microfilm 1,310,186. Name Variation Mary M. Richard was also known as Mae. Name Variation Mary M. Richard was also known as Mary L.
Name Variation Mary M. Richard was also known as Mame. 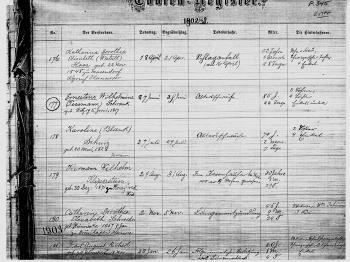 Married Name 12 August 1919 As of 12 August 1919,her married name was Udelhofen. Mary M. Richard was born at Paris Twp, Grant, Wisconsin, on 8 March 1900. 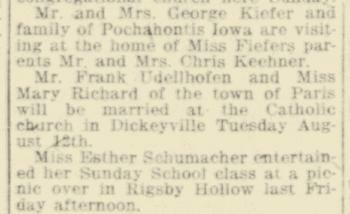 Mary M. Richard married Frank Arlow Udelhofen, son of Gerhart Udelhofen and Mary Emma VanNatta, on 12 August 1919 at Holy Ghost Church, Dickeyville, Grant, Wisconsin, Frank Udelhofen and Mary Richard engagement announcement. grandchildren; 36 great-grandchildren; and 4 step-great-grandchildren. She was preceded in death by her husband, Frank A. Udelhofen, on July 20, 1971; a son, Ralph, on Dec. 26, 1981; and another son, Merlin, on Nov. 12, 1991. Funeral services were held on Wednesday at Holy Ghost Church in Dickeyville, with burial in the church cemetery. The Casey Funeral Home in Cuba City was in charge of the arrangements. She was buried after 27 February 1994 at Holy Ghost Church, Dickeyville, Grant, Wisconsin. Mary was one of a triplet. The other two died. 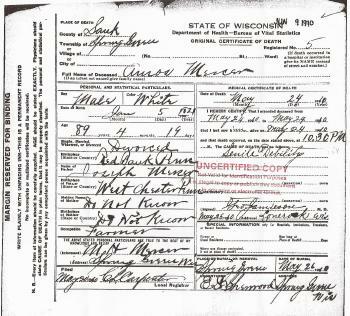 Mary M. Richard obtained US Social Security Card at Wisconsin; last residence Potosi, Grant, Wisconsin. In August 1969 DICKEYVILLE. 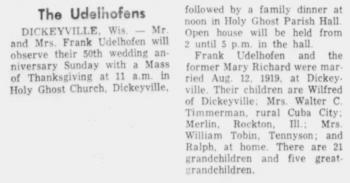 Wis — Mr and Mrs. Frank Udelhofen will observe their 50th wedding anniversary Sunday with a Mass of Thanksgiving at ... (Dubuque Telegraph Herald August 11, 1969). In August 1969 Frank and Mary (Richard) Udelhofen - 50th wedding anniversary. Name Variation Maude Barbara Mcclain was also known as Maude Belle. Married Name 29 September 1934 As of 29 September 1934,her married name was Wehnke. Maude Barbara Mcclain was born on 28 February 1914 at Paris, Grant, Wisconsin, also reported as February 20, 1914. 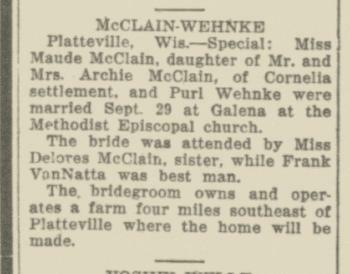 Maude Barbara Mcclain married Purl John Wehnke, son of Edward Eide Julius Wehnke and Nellie Laura Rosina Harms, on 29 September 1934 at Methodist Episcopal church, Galena, Jo Daviess, Illinois, Maude McClain and Purl Wehnke marriage announcement. 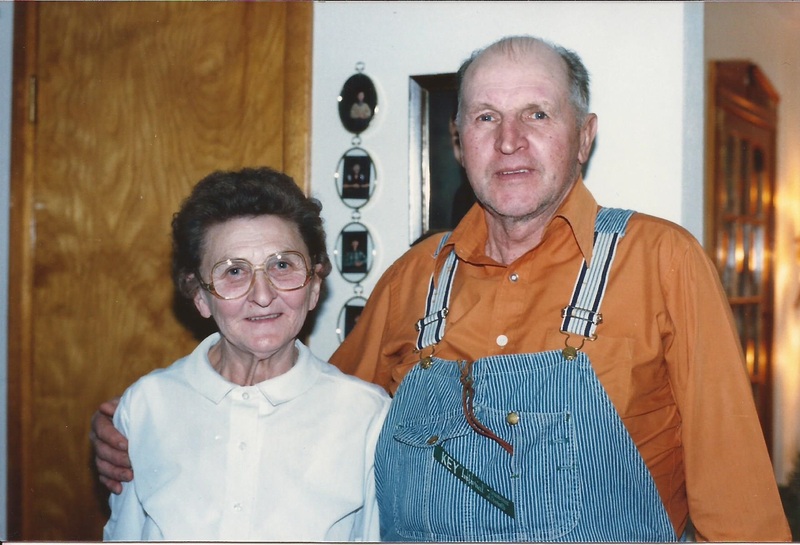 Maude Barbara Mcclain died on 18 October 2014 at Platteville, Grant, Wisconsin, at age 100 Maude B. Wehnke, 100, of Platteville died on Saturday, October 18, 2014, at her home. Funeral services will be at 11:00 a.m. Tuesday, October 21, 2014 at First English Lutheran Church, Platteville. Rev. Mike Short will officiate. 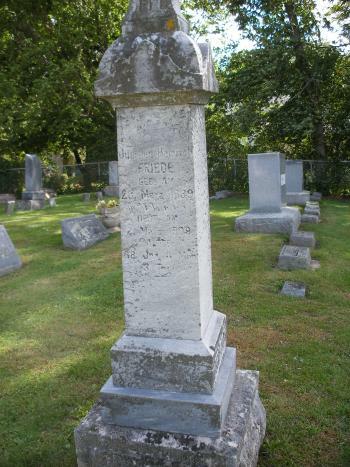 Burial will be at Hillside Cemetery, Platteville. Friends may call on Monday from 4:00 – 8:00 p.m. at the Melby Funeral Home & Crematory, Platteville, or from 9:30 a.m. until the time of the service on Tuesday at the church. 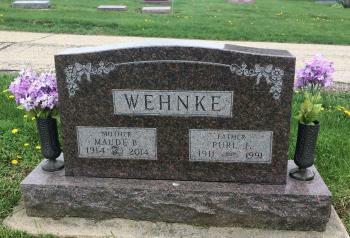 Memorials may be made to the Maude B. Wehnke Memorial Fund. Online condolences can be made at www.melbyfh.com. Maude was born on February 28, 1914 in Grant County, Wisconsin, the daughter of Art and Annie (Richards) McClain. 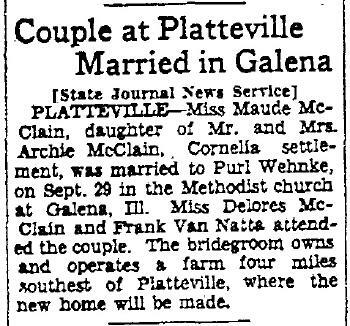 She was united in marriage to Purl J. Wehnke on September 29, 1934 in Galena, Illinois. He preceded her in death on April 15, 1991. She and Purl farmed outside of Platteville until 1965, where they then moved to Platteville. She was a cook part-time for the Platteville School District. She was a member of First English Lutheran Church, Platteville, where she was active member. 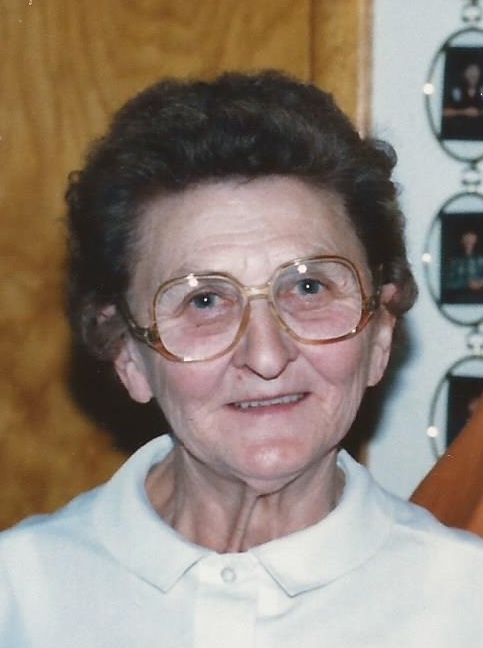 She for many years helped with funeral dinners and quilted with fellow members of the church. She was a member of Rebekah Lodge #114. She always enjoyed playing cards in her card club, and visiting with friends and neighbors. She loved to spend time with her family and to help them. She is survived by her son, Roger (Elaine) Wehnke of Potosi, WI; three grandchildren, Bob (Amy) Wehnke of Columbus, OH; Laura Rados of Ft. Walton Beach, FL; Scott (Michelle) Wehnke of Platteville; ten great-grandchildren, Miranda, Sam, Sarah, Helena, Katelyn, McKenzie, Julia, Parker, Paxton and Avery; one great-great-grandson, Hayden; sister, Anna Mae (Jim) Engelke of Platteville; Arnold (Darlene) McClain of Waukesha, WI; and nieces and nephews. She was preceded in death by her parents, husband, son, Robert “Bob” Wehnke in 1958, two sisters, Dolores Gehrke and Viola Friede. She was buried on 21 October 2014 at Hillside Cemetery, Platteville, Grant, Wisconsin. In February 1987 at visit by their nephew Richard Friede's family, Wisconsin, Maude (McClain) and Purl Wehnke at their home. 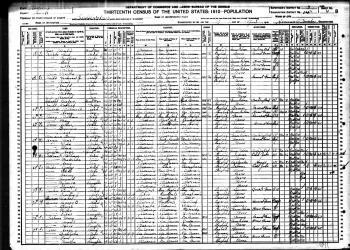 [S250] U.S. Federal Census 1930 U.S. Federal Census, by Ancestry.com, ED22-25. Dwelling 186. Name Variation Delores May McClain was also known as Delores Elizabeth. Name Variation Delores May McClain was also known as Dolores. Married Name 25 December 1935 As of 25 December 1935,her married name was Gehrke. Delores May McClain was born on 28 June 1918 at Paris, Grant, Wisconsin. 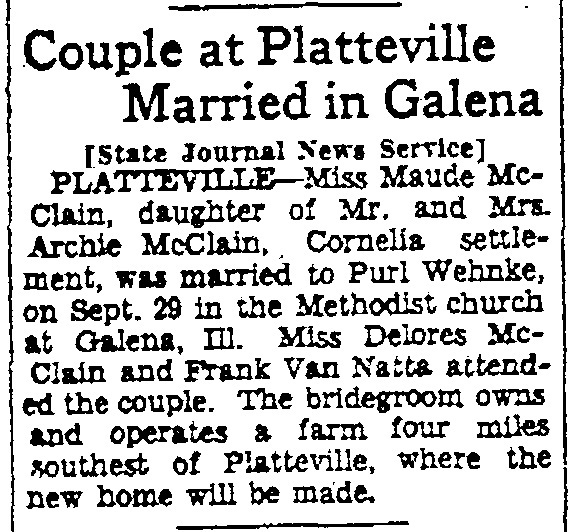 Delores May McClain married Donald John Gehrke, son of Albert Gert Gehrke and Martha Emma Martens, on 25 December 1935 at Boone, Illinois. Delores May McClain died on 19 October 2008 at Kenmore, King, Washington, at age 90 obituary in Seattle Post-Intelligencer 29 Oct 2008 "Deceased Name: GEHRKE: Delores M.
90, of Shoreline, Oct. 19." She was buried after 19 October 2008 at Acacia Memorial Park and Funeral Home, Seattle, King, Washington. Delores May McClain obtained US Social Security Card at Washington; last residence Kenmore, King, Washington. Name Variation Anna Mae McClain was also known as Ann. Name Variation Anna Mae McClain was also known as Anna May. Married Name 30 June 1951 As of 30 June 1951,her married name was Engelke. Anna Mae McClain was buried at Belmont Cemetery, Belmont, Lafayette, Wisconsin, Inscription: Married 6/30/1951; children Karen, Susan, Michael. She was born on 30 September 1931 at Wisconsin. Anna Mae McClain married James William Engelke, son of Henry Herman Nicholas Engelke and Fern Olive Robinson, on 30 June 1951. In August 1952 Engelke in Japan - Pfc. James W. Engelke, whose wife lives in Platteville, is training with the 24th Infantry Division in Japan. He arrived in Japan Aug. 6 and is in the division's 21st Regiment. He entered the army in February, 1951, and received basic training at Ft. Jackson, S. C. Anna Mae McClain and James William Engelke lived in 2007 at 29950 Cth B, Platteville, Grant, Wisconsin. Anna Mae McClain lived in 2017 at Platteville, Grant, Wisconsin.